Rural unrest began with when a drought that threatened the harvest of 1788 was followed by storms and floods which destroyed much of what remained. In the following winter, frosts and snow damaged vines and orchards. Château de Cheverny is the final post of from my 10 Days In Paris, and while the pace of the trip has been tireless, I still leave with a long list of sights yet unseen for my next visit. Château du Clos Lucé. If you thought that Leonardo da Vinci is buried in his native Italy, or that his famous Mona Lisa arrived at the Louvre as a spoil of war, you’d be wrong on both counts. It was the artist himself who, in 1516, brought his paintings Mona Lisa, Virgin and Child with Saint Anne, and St. John the Baptist with him to France. 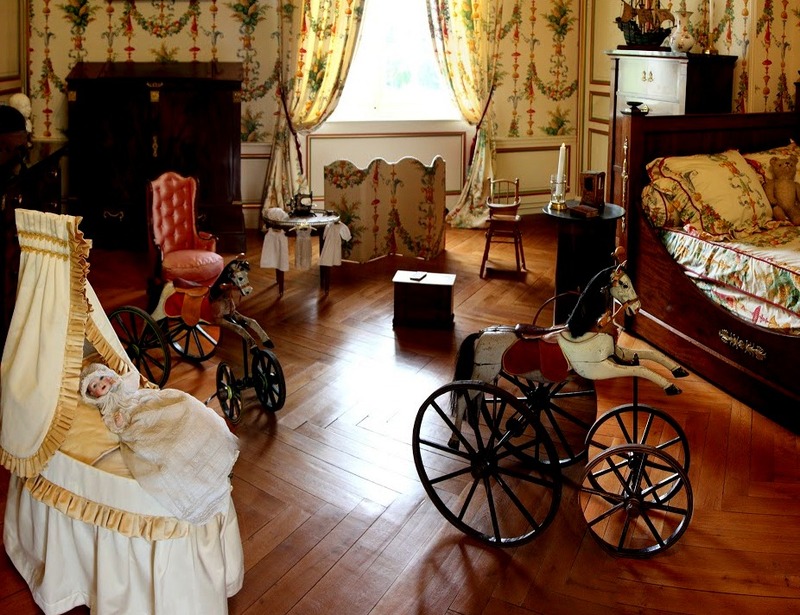 The Château du Clos Lucé, where he lived until his death three years later, is now a museum that displays over forty models of his machines. The king of France bought the now-famous paintings from Leonardo’s estate, and the Mona Lisa hung in the royal palaces at Fontainebleau and Versailles before it was moved to the Louvre after the French Revolution. That these paintings today sit in The Louvre is remarkable, because Leonardo almost never made it toFrance. While Da Vinci had long-standing invitations from French kings to move to France, he accepted only when his patron Giuliano de Medici died in 1516. 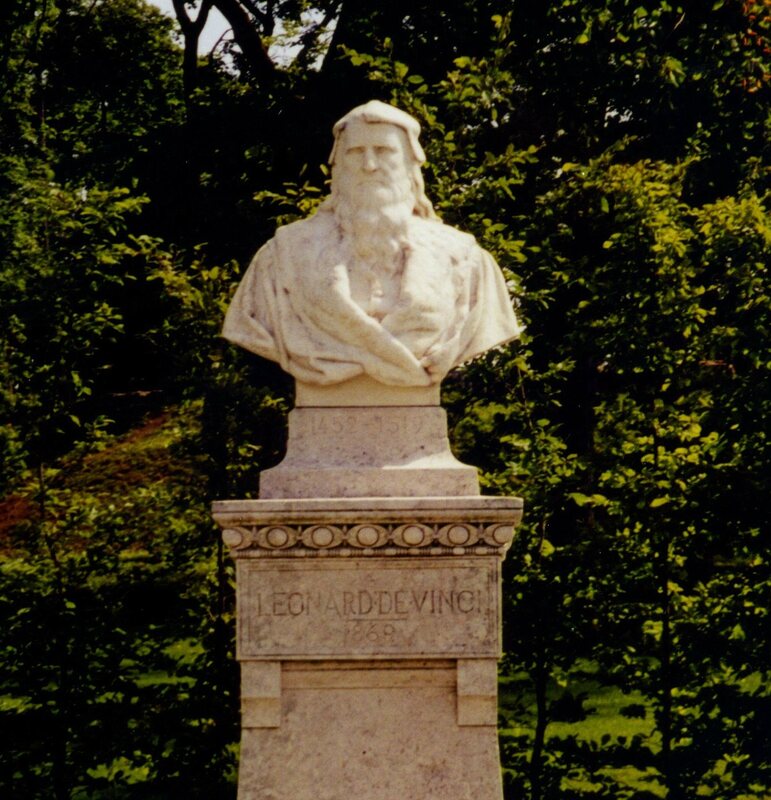 Although paralysis in one arm had rendered da Vinci unable to paint, King Francis I welcomed him warmly and installed him in the Chateau Clos Lucé, adjacent to the king’s own Château d’Amboise. 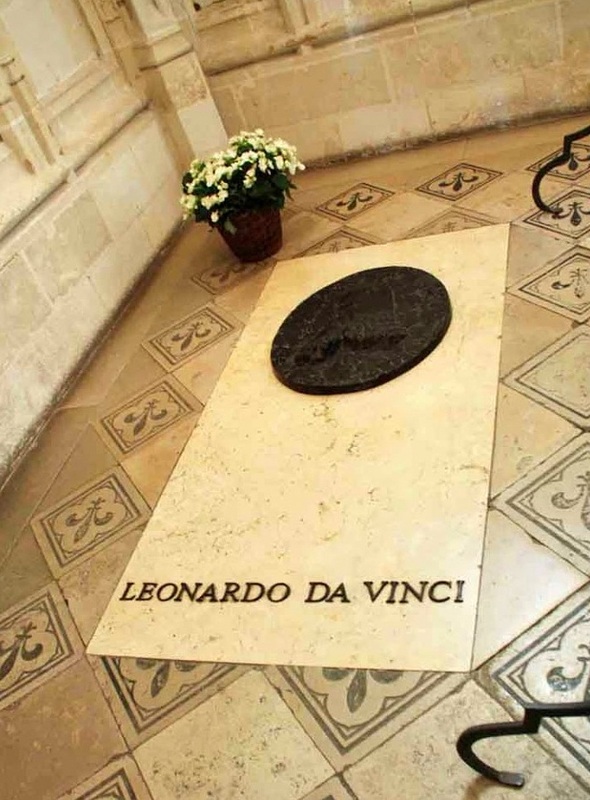 Their friendship was so close that Leonardo’s chateau was connected to the king’s by an underground passage. 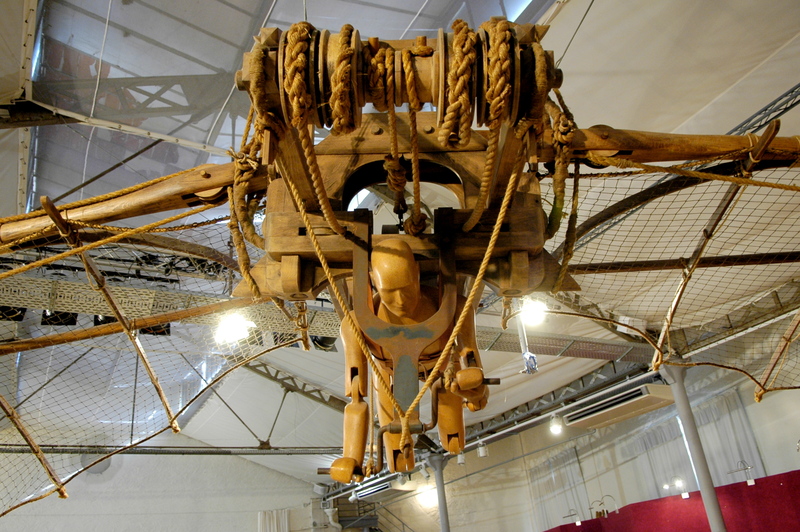 Leonardo repaid Francis’s hospitality by designing and constructing grand engineering projects. He also brought with him his mechanical lion, which was able to walk a few steps and open its chest to present the king with a cluster of lilies. 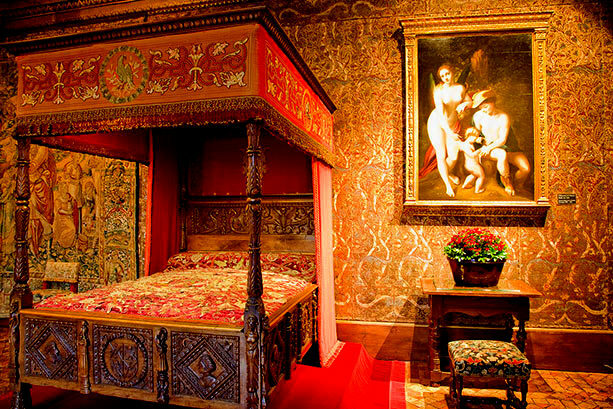 Legend has it that a 67-year-old Leonardo died in King Francis’s arms. Gallery bridge at Château Chenonceau. Château Chenonceau. 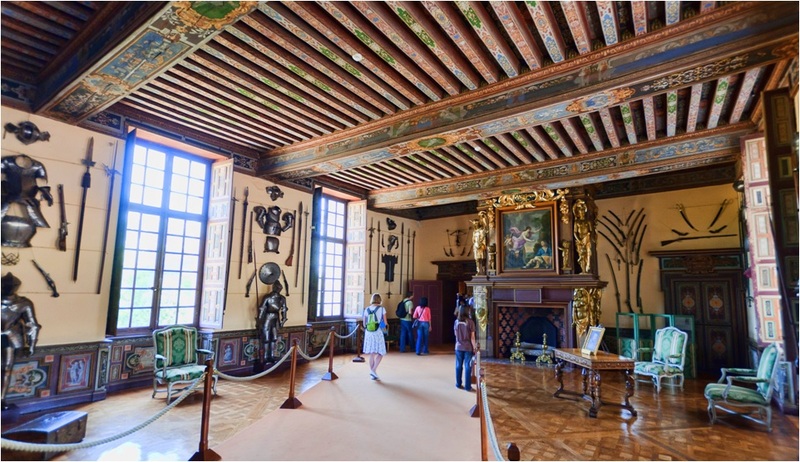 This Loire Valley château has an incredible history marked by historical notables, a long succession of owners, and ongoing threat of destruction by revolution and war. 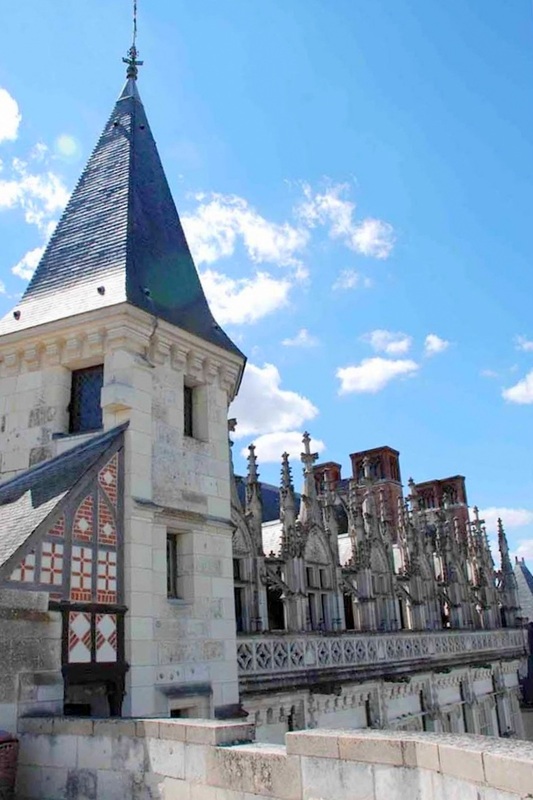 The best -known of the Loire valley châteaux, the current version was completed in 1522, and is an architectural mix of Gothic and Renaissance. Henry II gave it to his mistress, Diane de Poitiers, after seizing the property for unpaid debts in 1535. It was Diane who commissioned construction of the signature bridge which joins the château to the opposite river bank. She also ordered the planting of gardens laid out in four triangles. 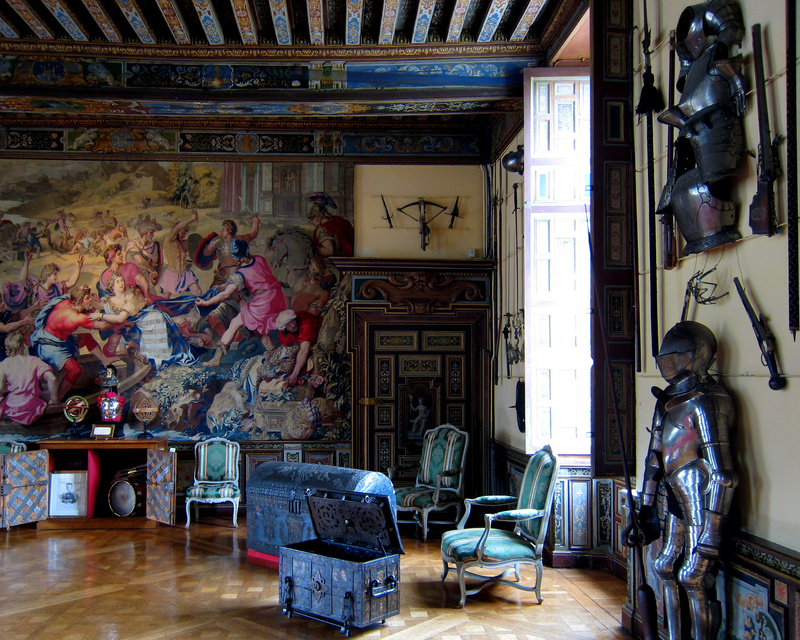 Henry II’s widow and regent Catherine de Medici appropriated the chateau as her residence upon her husband’s death. She added a new series of gardens, and enclosed and dedicated the river bridge as a gallery. Upon Catherine’s death, the château, again encumbered by debt, passed to her daughter-in-law Louise, wife of King Henry III. 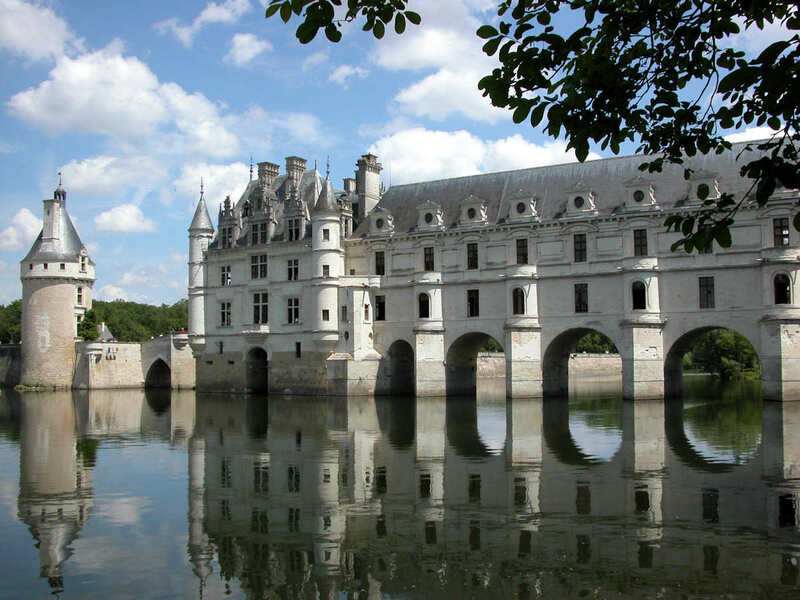 Henri IV, France’s first Boubon king, paid off Catherine’s debts in order to acquire Chenonceau for his mistress, Gabrielle d’Estrées. 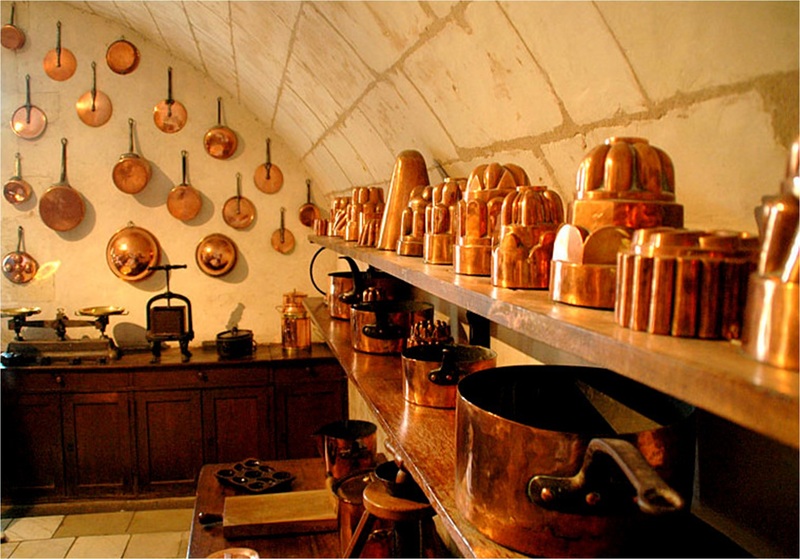 The Bourbons, however, used Chenonceau only as a hunting lodge until the Duke of Bourbon sold the castle’s contents in 1720. 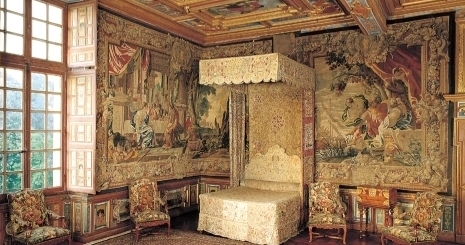 Much of its collection can still be seen today at Versailles. In 1733, the estate was bought by a wealthy squire whose wife, Louise, hosted literary salons which attracted notables including Voltaire and Montesquieu. 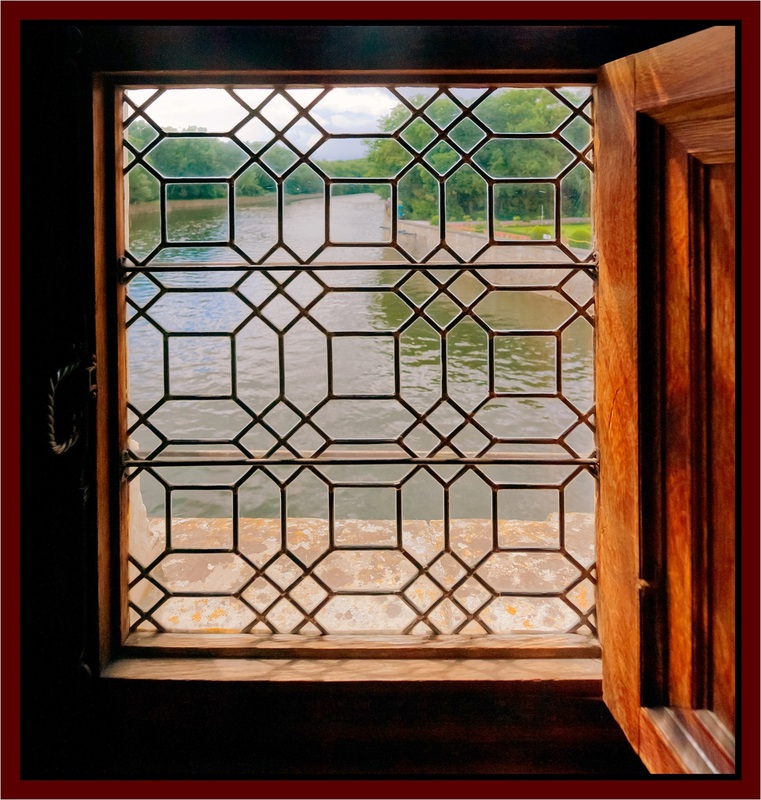 Jean-Jacques Rousseau, for a time the owner’s secretary and his son’s tutor, wrote part of his book Émil at Chenonceau. River view from gallery bridge, Château Chenonceau. In 1864, heiress Marguerite Pelouze acquired the château and commissioned its complete restoration. The cost of the renovation drove her into debt, and the château was bought by a Cuban millionaire who sold it in 1913 to renowned chocolatier Henri Menier. 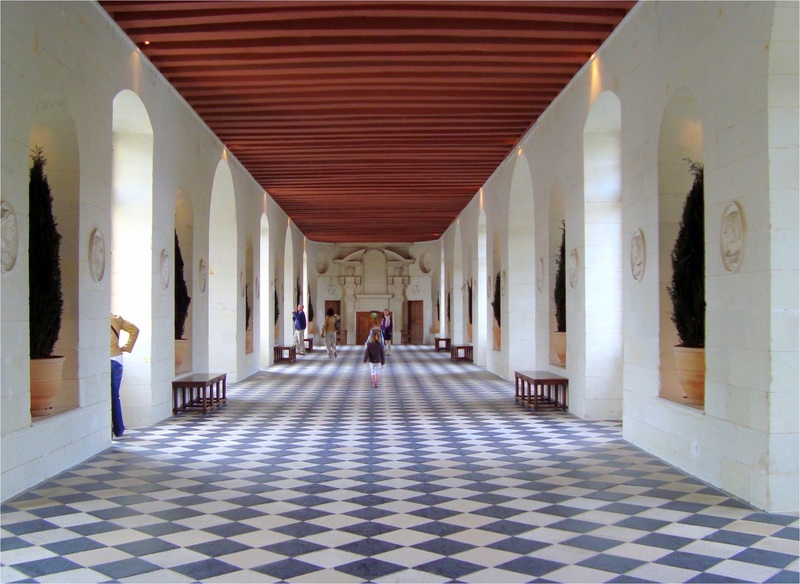 During World War I, the chateau’s bridge gallery was used as a hospital ward. Bombed by the Germans in 1940, it later served as an escape route across the river from Nazi-occupied France to Vichy France. 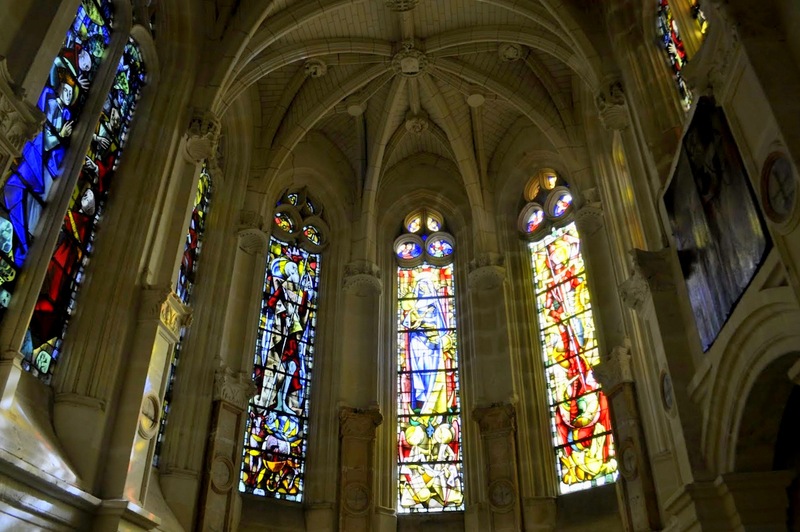 The original windows in its chapel were destroyed by Allied bombing in 1944. The Menier family restored the chateau in 1951, and owns it to this day. 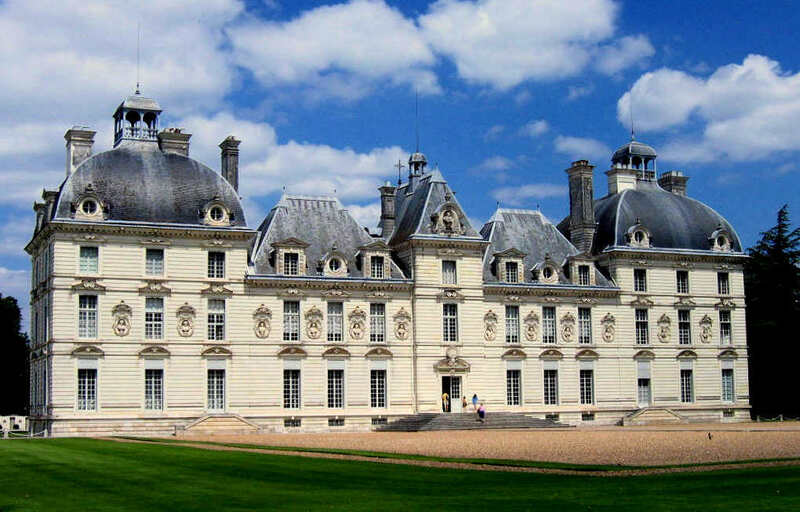 Next week’s post: The Loire Valley’s Châteaux de Cheverny and Chambord. A celebrated cathedral dating from the High Middle Ages… caves in which acres of champagne bottles ripen… and miles of French countryside laced with vineyards make a day trip to Reims a great change of pace and a feast for the senses. Ninety miles northeast of Paris, it’s readily accessible by train, and the scenery along the route is so bucolic that it’s hard to believe that by the end of World War I it had become a pockmarked no man’s land of trenches and shell craters. 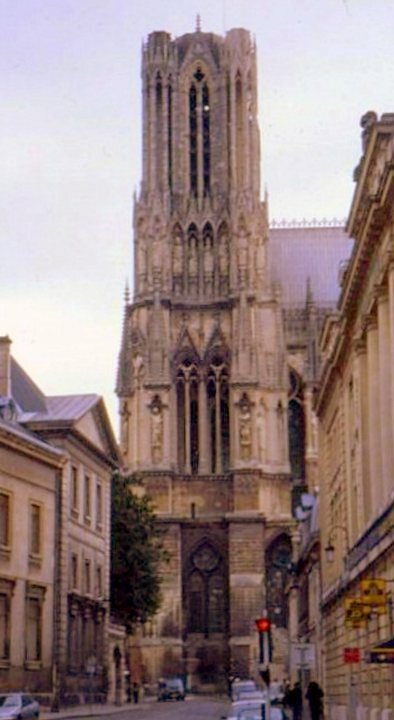 The cathedral of Notre-Dame de Reims dominates the city skyline. The bells in its twin, 250-foot bell towers weigh up to eleven tons, and its weathered walls are covered in medieval sculptures and bas-reliefs. 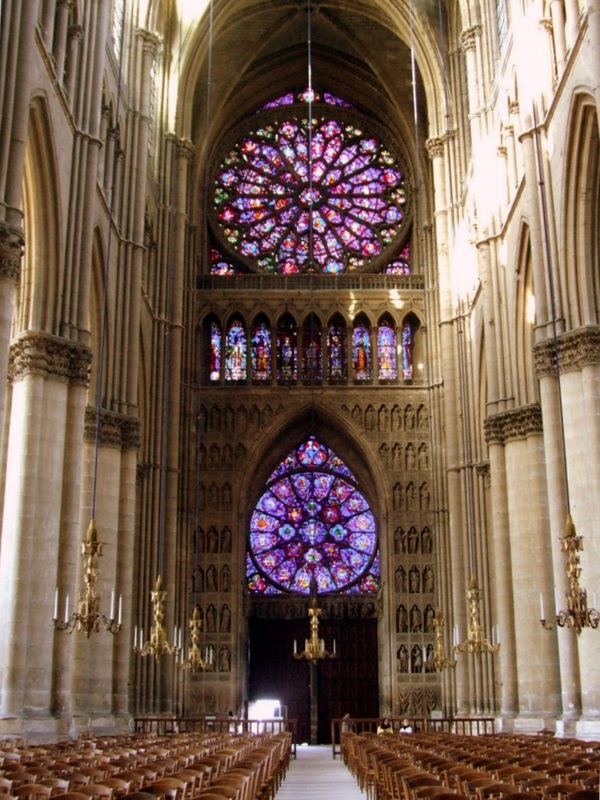 While Gothic cathedrals like the one at Reims still deliver stunning impact more than eight centuries after they were built, they represented at the time of their construction the greatest advance in architecture since the Roman arch. Through the early Middle Ages, tall buildings required the support of thick and windowless walls, and their interiors were predictably dark and dank. Just after the end of the first millennium, French architects innovated the pointed arch, the flying buttress, and the ribbed vault to create cathedrals which captured vast, soaring spaces flooded with light streaming through towering stained glass windows. Competition among Europe’s cities to outdo each other’s cathedrals followed, and most of the Gothic Cathedrals were built in the first 200 years of the second millennium. The work often demanded a century or more of effort by hundreds of workers and artisans. These structures remained feats of engineering largely unsurpassed until the arrival of structural cast iron and steel beam buildings nearly a millennium later. 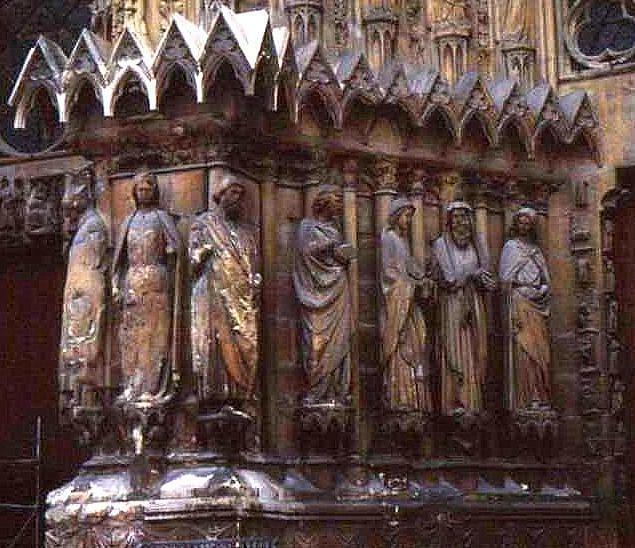 Few if any of these cathedrals, though, have borne witness to so much history as the one at Reims, a UNESCO World Heritage site. 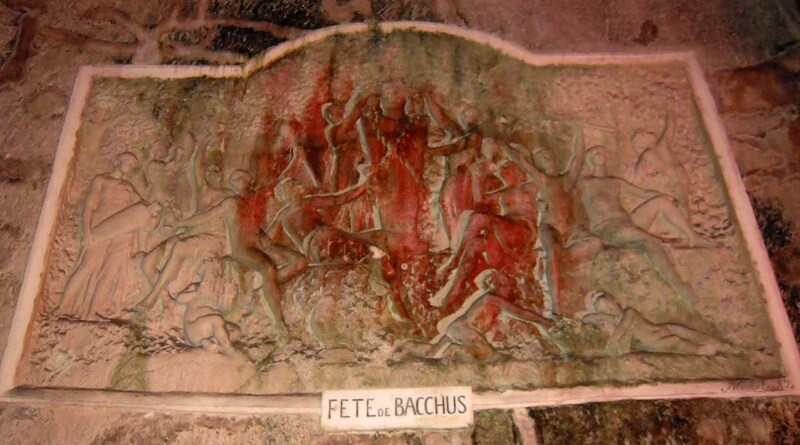 Clovis, first king of the Franks, was baptized in a church on this site in AD 496, and kings of France were crowned here for nearly 1500 years. When the English army occupied the city during the Hundred Years’ War, the coronation of King Charles VII was delayed until the city could be retaken in 1429 by an army under Joan of Arc. 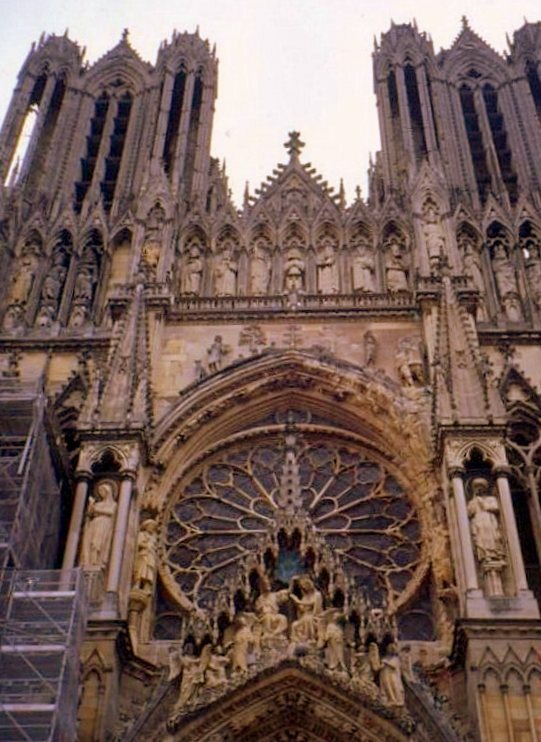 During World War I, German shellfire damaged or destroyed important parts of the cathedral, and restoration work was not fully completed until 1938. 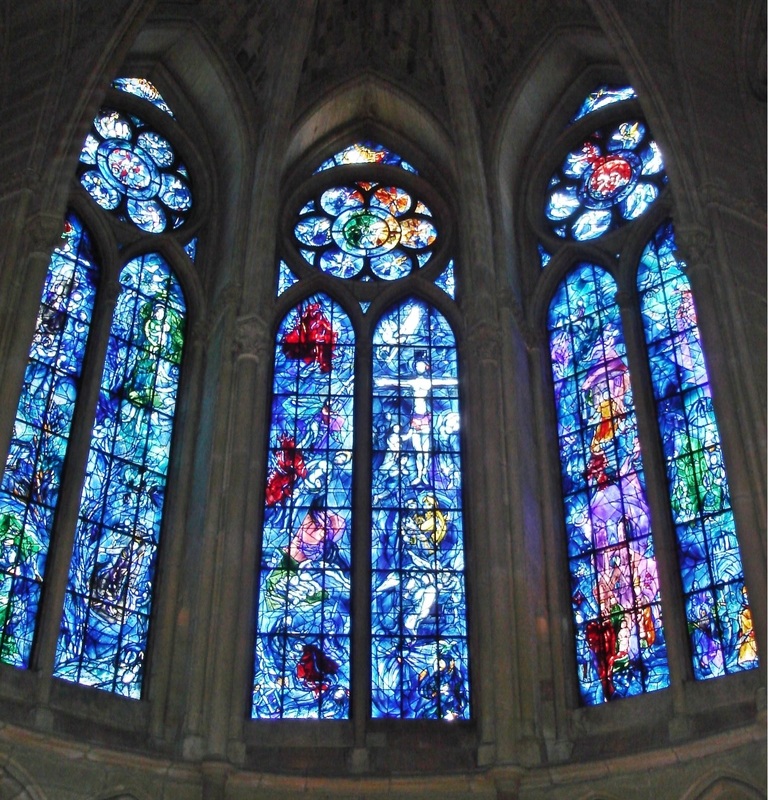 In 1974, Marc Chagall completed a six-year collaboration on three stained glass windows for one of the cathedral’s chapels that replace windows dating from the nineteenth century. Reims sits in the heart of the champagne district, and the Chateau Pommery is arguably the most interesting of the many producers nearby. 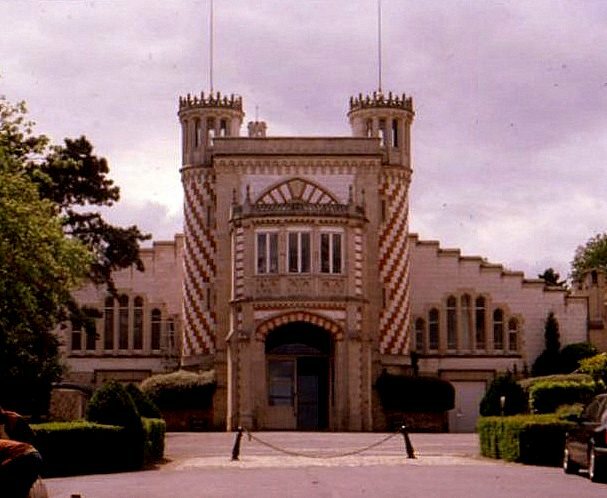 Its buildings are an eclectic mix of fairytale architecture that reflects the highly original mind of Madame Louise Pommery, the widow of founder Alexandre Pommery. 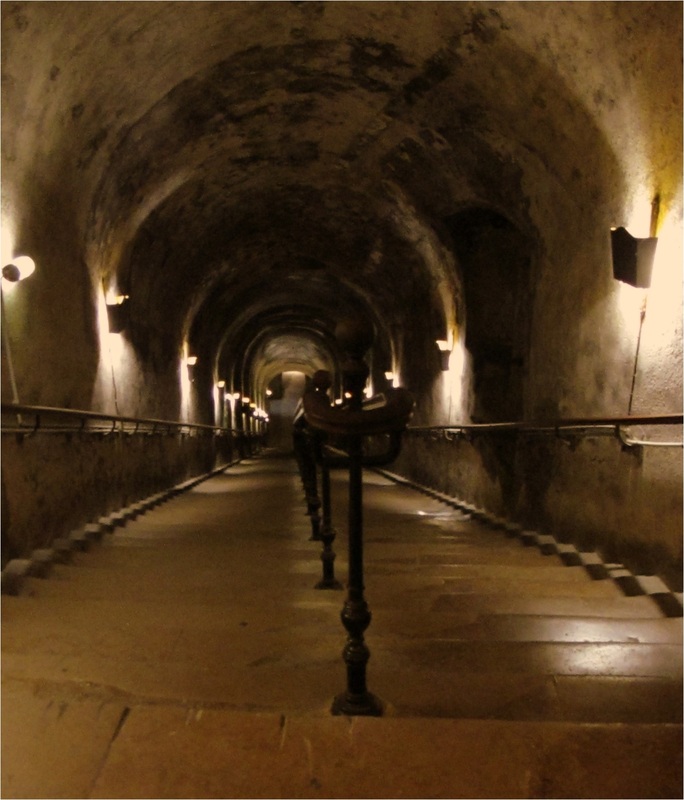 It was Madame Pommery’s vision to purchase chalk and limestone pits that dated back to the Romans, and created from them cellars expansive enough to store and age over twenty million temperature-controlled bottles. 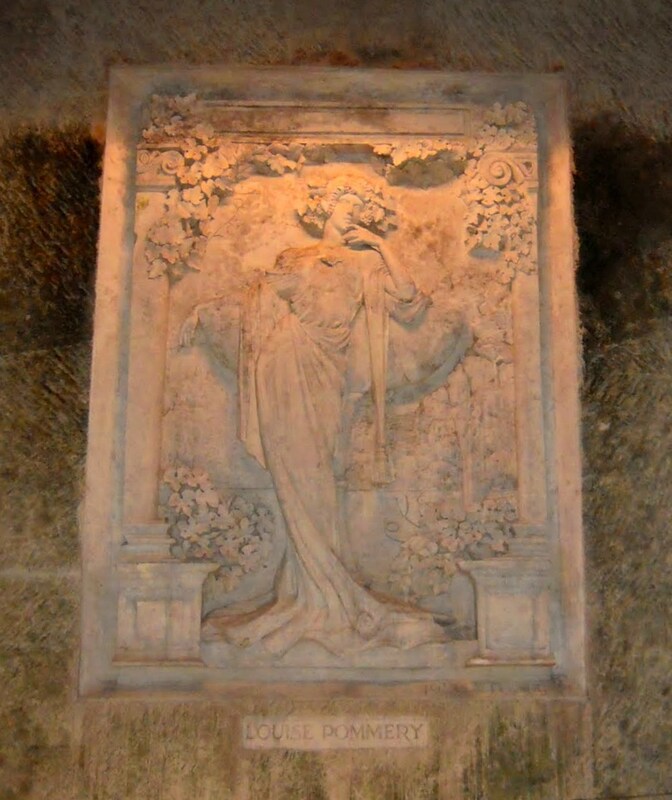 It was also Madame Pommery who commissioned artful bas-reliefs for the cave walls that are now a signature feature of this subterranean fantasy. 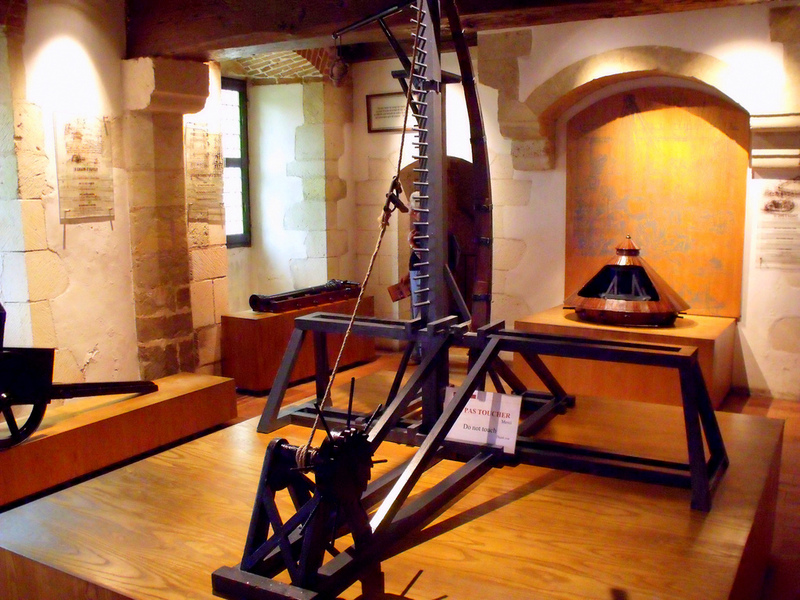 While there have been vineyards in this part of France since the time of the Romans, sparkling wines did not come of age until centuries later. 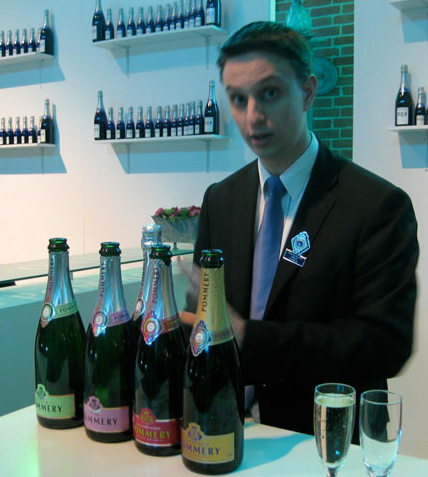 Winemakers in Champagne had long considered the bubbles in their wine to be a fault, but when sparkling wines became popular in British high society, the fashion jumped the channel to become the drink of choice for French royalty. 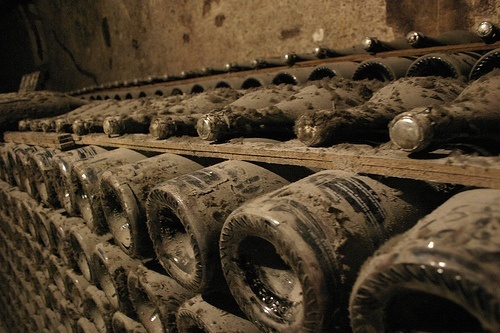 It was not until the 1800’s that winemakers finally learned to control the fermentation process, and technology allowed the production of bottles which could withstand the pressure of carbonation. In the early part of the twentieth century, the champagne industry was threatened by setbacks including vineyard blight, rioting growers, and the loss of the Russian market to the revolution and the American market to Prohibition. Production was also stifled by two World Wars. The all of it, French champagne managed to survive, and the proof is, of course, in the tasting! 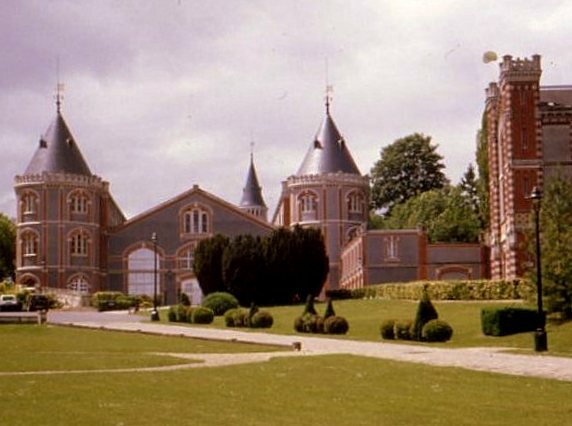 The cathedral is about six miles from the train station, and Chateau Pommery is less than two miles from the cathedral. 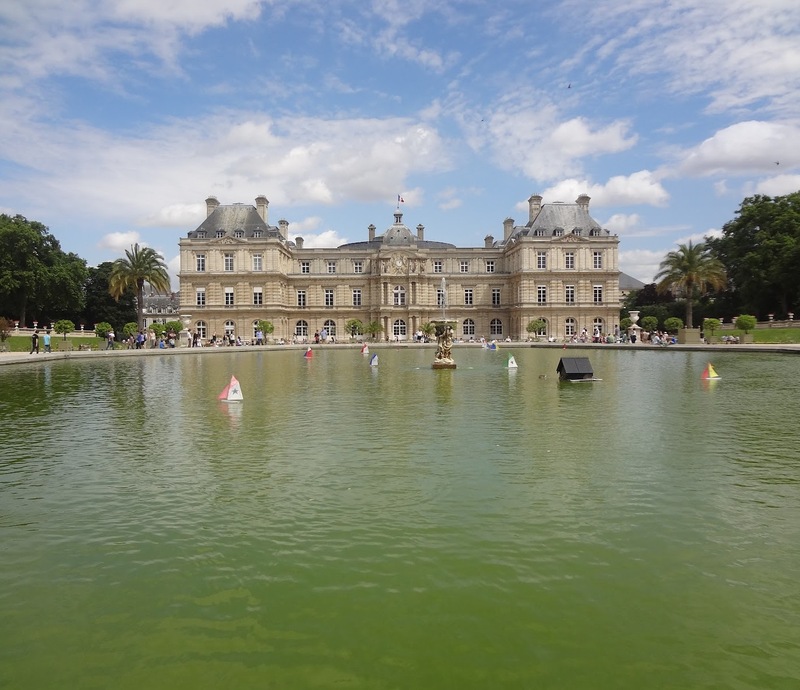 There are so many great museums in Paris that the challenge is to decide which are the must-see’s, and the larger museums are so expansive that a savvy tourist will have a game plan for each. Between them, the Louvre, the Musée d’Orsay, and Les Invalides are home to historic art dating from the ancient Greeks into the early twentieth century. 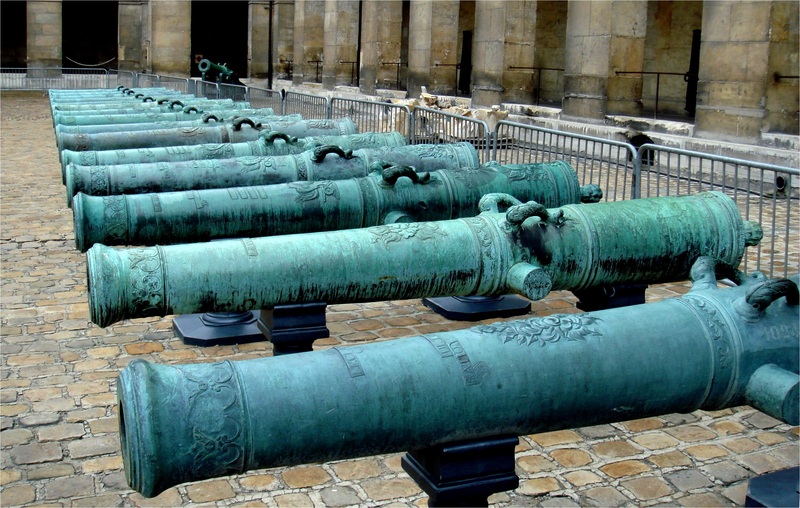 These monumental buildings and the artifacts that they contain also document nearly 500 years of French history. 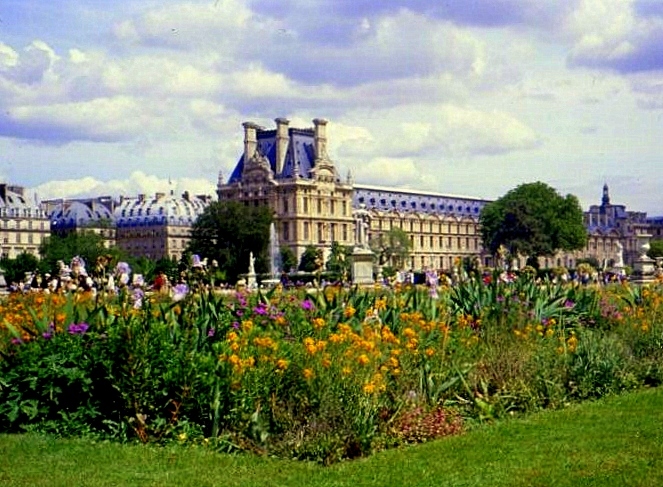 The Louvre is a jaw-dropper even without its world-class art collection. Built as a palace fortress late in the 12th century, it has since been extended many times. Its life as an art museum began when Louis XIV moved his court from Paris to Versailles and left much of his collection at The Louvre, which was designated a national art museum as an outcome of the French Revolution. Only a few hundred works – including the Mona Lisa – were on display for the 1793 opening. The collection was subsequently expanded with pieces brought back from Northern Europe and the Vatican back by France’s revolutionary armies, including Veronese’s Wedding at Cana. 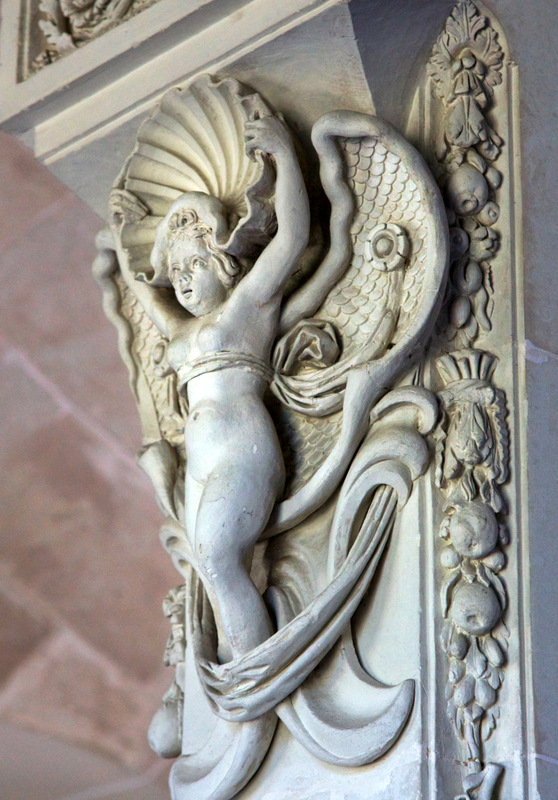 Additions made to the collection throughout the 1800’s by France’s emperors and kings included the Venus de Milo, Canova’s Psyche Revived by Cupid’s Kiss, the Pietà of Villeneuve-lès-Avignon, the Winged Victory of Samothrace and a department of Egyptian antiquities. 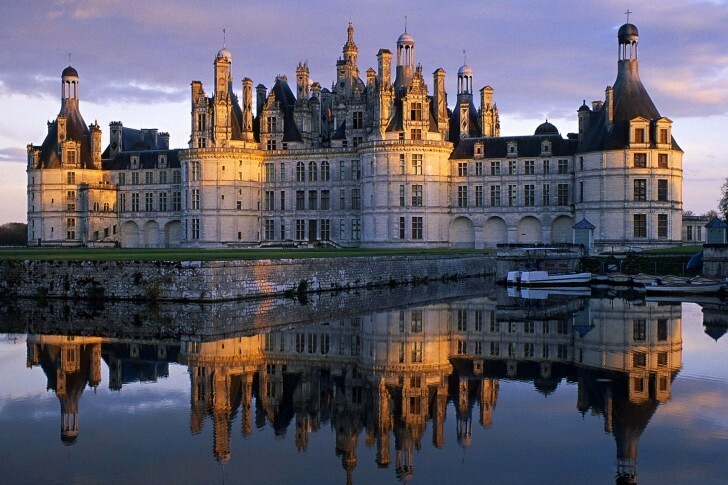 During World War II, most of the collection was hidden outside Paris, much of it at the Château de Chambord. 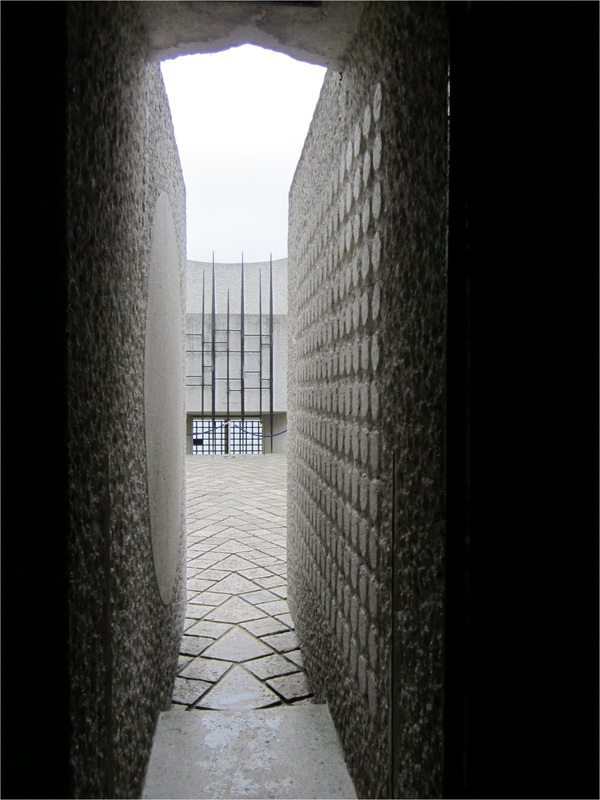 In 1983, architect I. M. Pei was commissioned to renovate the building. He conceived the now-iconic glass pyramid and underground lobby on which work was completed in 1993. The Mona Lisa and other works of the Italian Renaissance are the big draw here, but the crush of tourists makes the experience far from intimate. Anyone who’s previously seen works by the Italian masters in Rome’s Vatican Museum should consider browsing them quickly before opting for less-congested galleries. 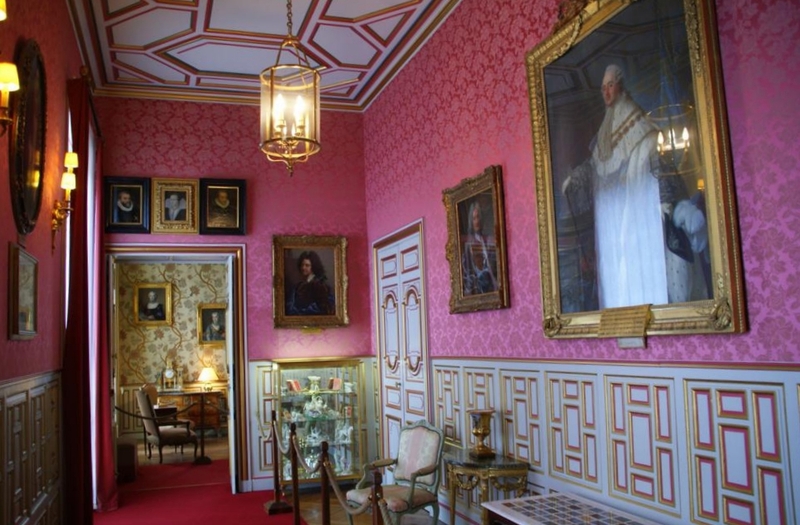 The collection of Dutch and Flemish masters is outstanding, and the apartments once occupied by Napoleon III are worth seeing. 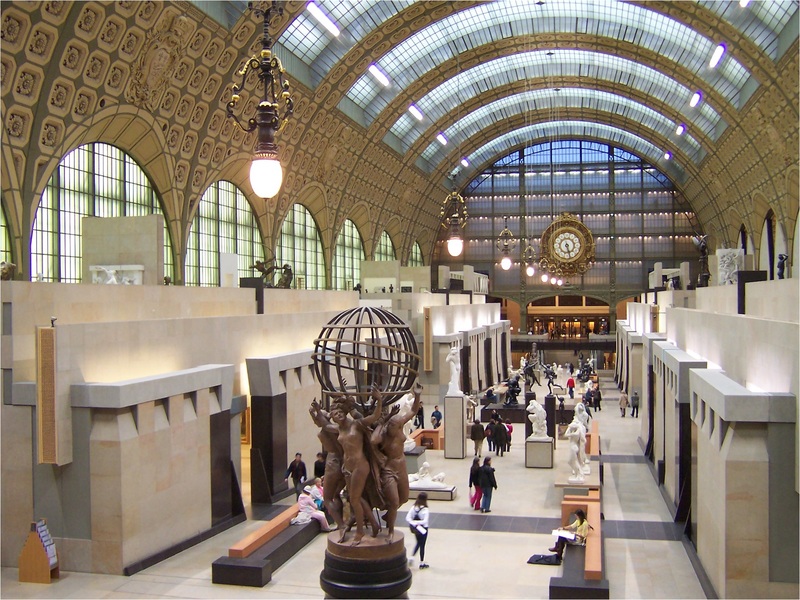 The Musée d’Orsay houses the largest collection of impressionist and post-impressionist masterpieces in the world. On exhibit here are works by Monet, Manet, Degas, Renoir, Cézanne, Seurat, Sisley, Gauguin and Van Gogh. 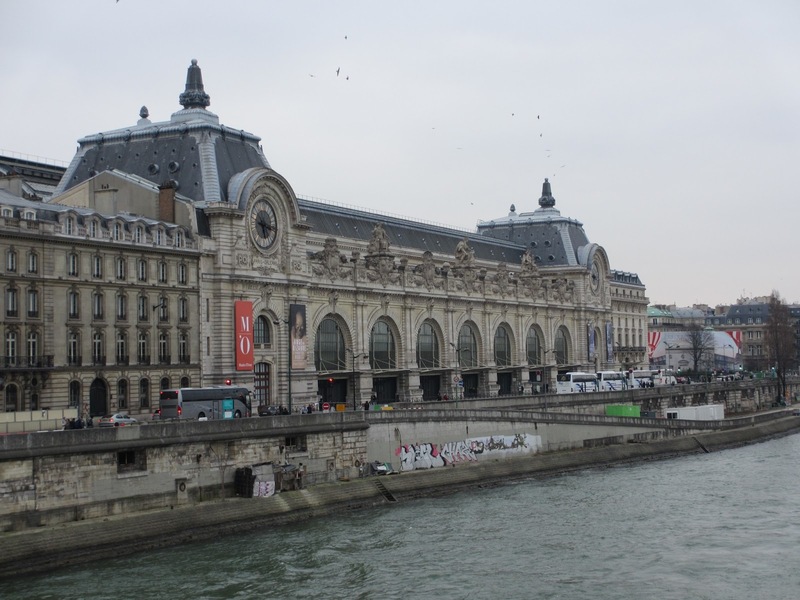 Constructed as the Gare d’Orsay rail station, it opened – along with the Eiffel Tower – at Paris’s 1900 Exposition, but by 1970 it had fallen into decline. 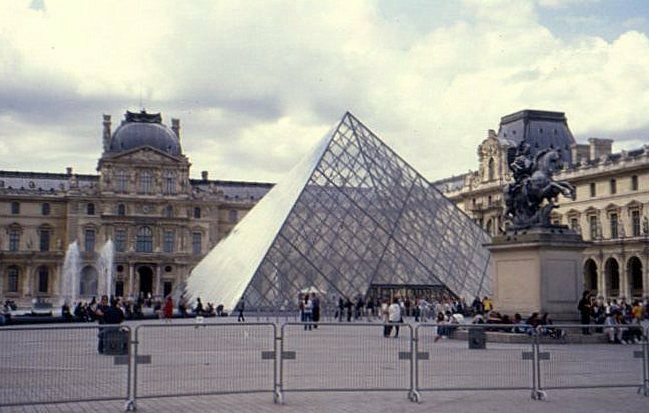 Slated for demolition, it was rescued by a proposal to convert it into an art museum that would bridge the gap between the Louvre and the Museum of Modern Art – the Pompidou Centre. Renovations began in 1978, and were completed in 1986. 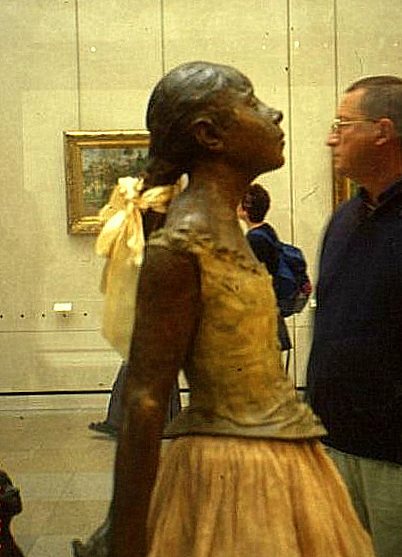 The installation of more than 2,000 paintings, 600 sculptures and other works took more than six months. 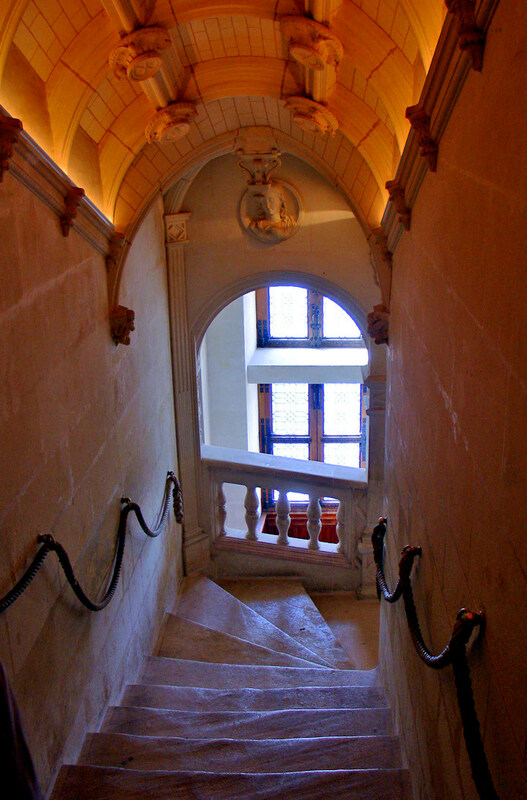 Les Invalides is a complex of museums and monuments first conceived by Louis XIV as a hospital and retirement home for war veterans. 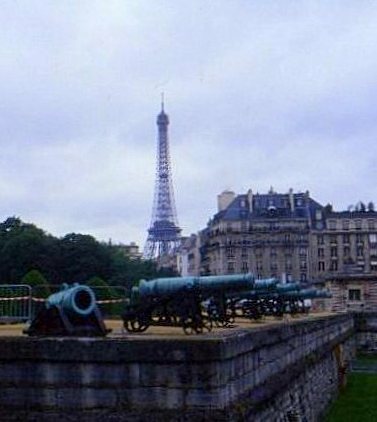 The armory of Les Invalides is where, on July 14, 1789, Parisian rioters on their way to the Bastille seized the cannons and muskets from its armory. 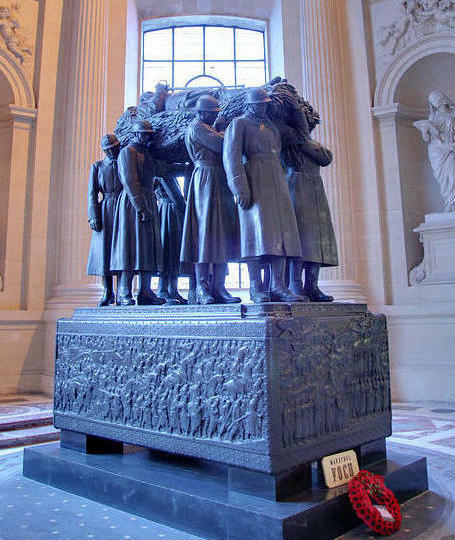 It now commemorates the military history of France, and although it’s most famously known as Napoleon’s tomb, other French war heroes are also buried within its walls. 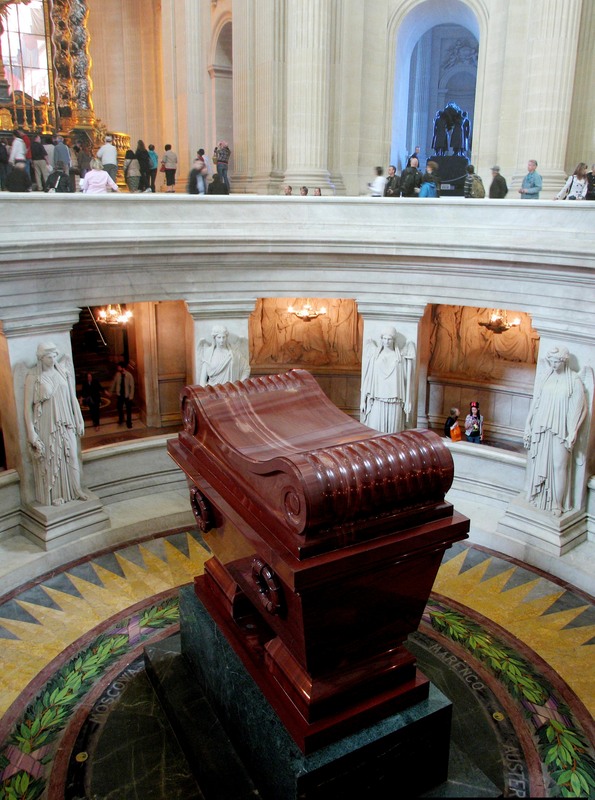 The body of Napoleon I was returned to France from Saint Helena and interred here in 1861. 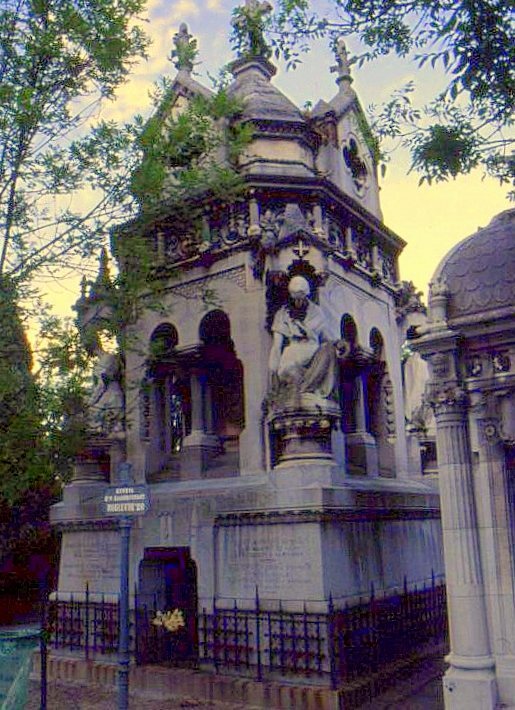 His only son, dead of tuberculosis at age 21, and his brothers Joseph and Jérôme are also buried here. 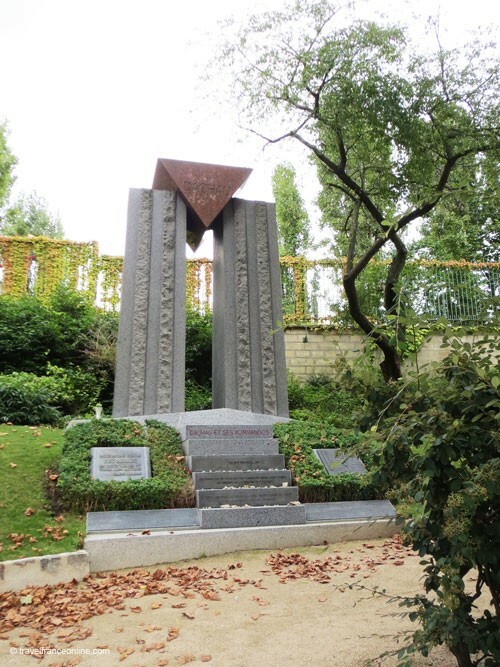 In the twentieth century World War I’s Allied Supreme Commander Marshal Ferdinand Foch and World War II’s General Philippe Leclerc, commander of the celebrated 2nd Armored Division, were also buried here. There’s also an extensive collection of medieval armor and weapons on display here. Next up for 10 Days In Paris: Reims and the Champagne country. There is something in most city dwellers which demands occasional respite from urban life, as if something in our genes reminds us that we are all descended from hunter-gatherers and farmers, and that cities are not our natural habitat. 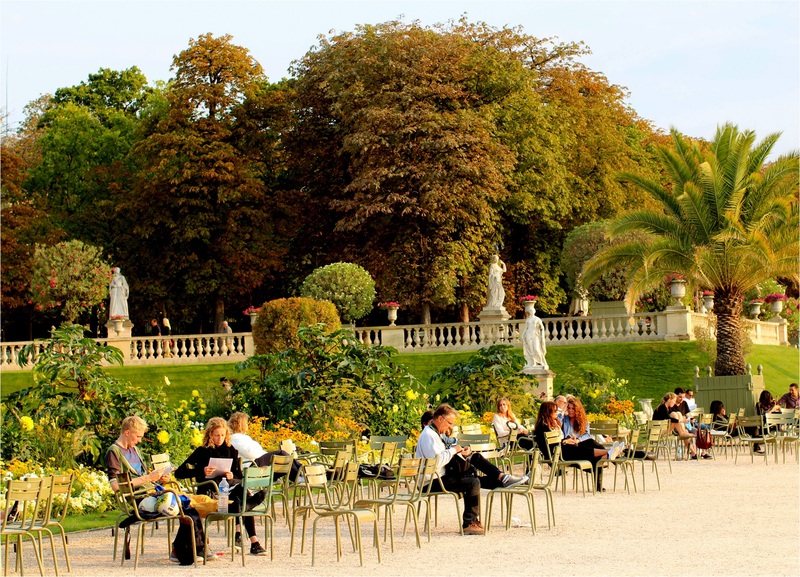 The Jardin du Luxembourg – the Luxembourg Garden – is where Parisians turn for such a respite. It’s a serenely pastoral urban space, and a national treasure that’s among the world’s finest urban parks. 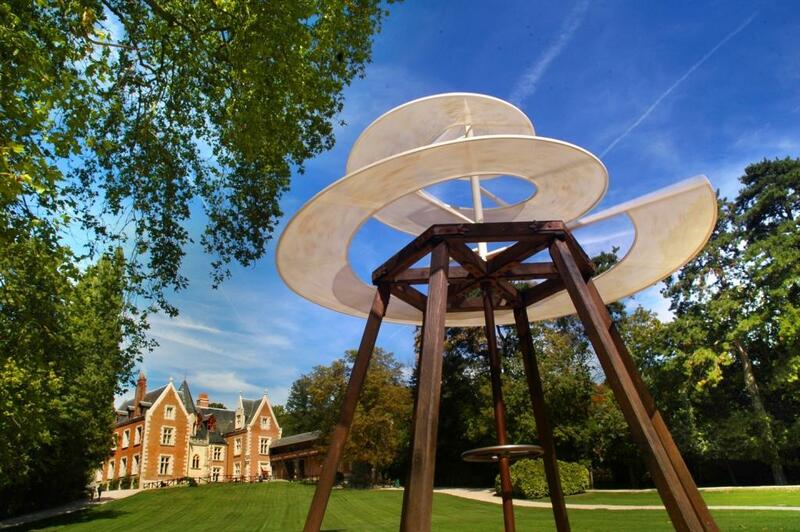 A cross between a botanical garden, a sculpture and art gallery, and a venue for performing arts and cultural events, the Garden always has plenty going on. 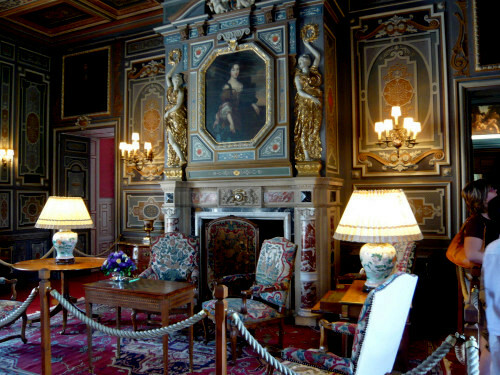 Now over 400 years old, it was created by Queen Marie de Medici to showcase her adjoining Luxembourg Palace, and both were designed to evoke the atmosphere of the Pitti Palace in the queen’s native Florence. 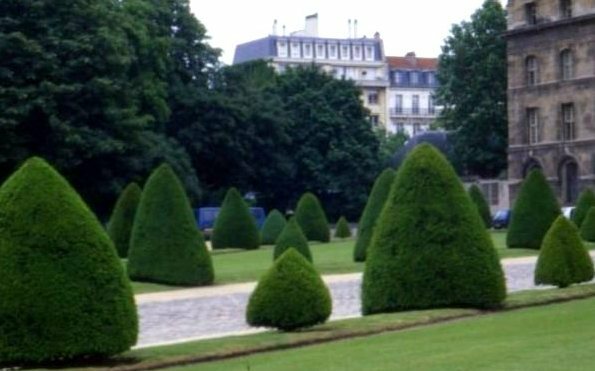 Today the French Senate meets in the former palace, and the 60-acre park is the property of the people of Paris, as it has been since the French Revolution. Perhaps, then, it’s no surprise that there’s an egalitarian feel to this place. It’s a destination for young and old, for the well-to-do and the rest, and for singles and couples and families. All sit side-by-side on park chairs and benches along gravel paths that pass among manicured lawns, tree-lined promenades, elegant flowerbeds, and stunning fountains. There are also walkers, joggers, and plenty of people just reading newspapers or books in the great outdoors. The centerpiece basin runs along a line from the Palace to the Paris Observatory, which lies a mile away beyond the park boundaries. The basin ends in the spectacular Observatory Fountain, the collaborative work of four different artists. On a Sunday afternoons, children float miniature sailboats in the Garden’s centerpiece basin. The foliage screens out the city, and the garden is a tranquil place in which everyone seems to respect everyone else’s space. 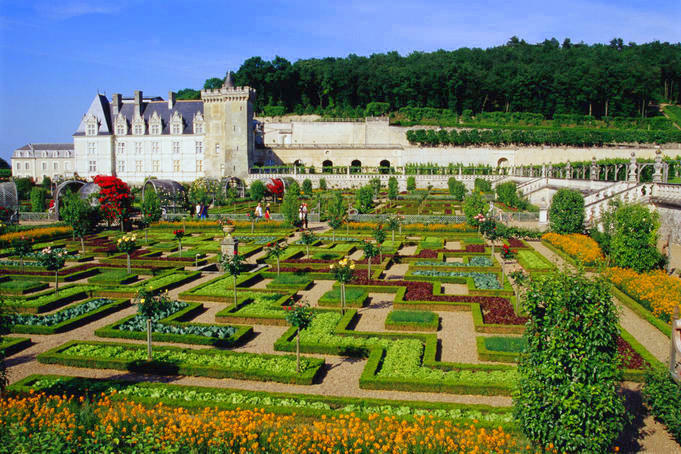 The Garden’s boundaries have grown and shrunk over four centuries, and it fell into disrepair in the years leading up to the French Revolution. It was not until the last half of the 1800’s that it was fully restored and expanded to its present footprint. Later additions include a new and more formal garden à la française, and a pond and statuary at the famous Medici Fountain. A diagonal alley from the Fountain reveals a view of the Pantheon, located less than mile to the east. 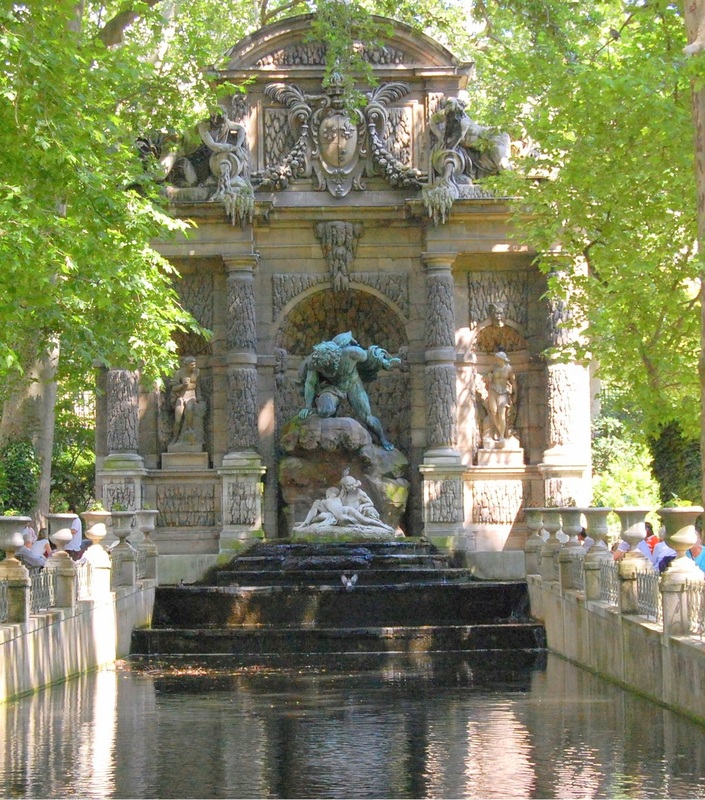 Late in the nineteenth century, the park became the home to a large population of statues that include the queens and other famous women of France. 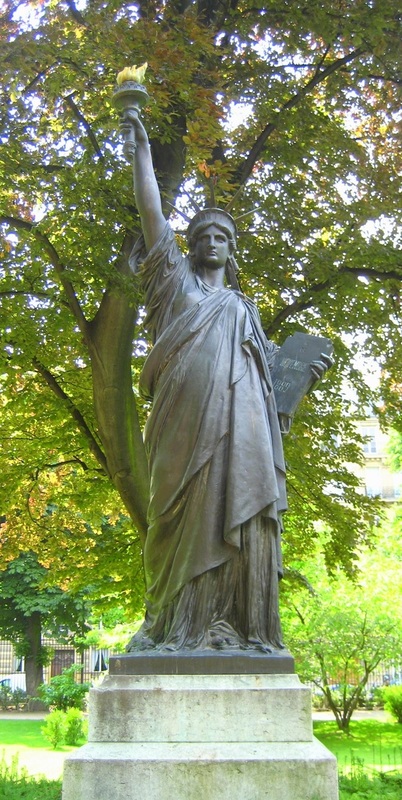 Other sculptures are monuments to French writers and artists, and there’s also a small-scale replica of the Statue of Liberty. In the southwest corner of the Garden is an orchard of apple and pear trees, and a large fenced-in playground for young children. 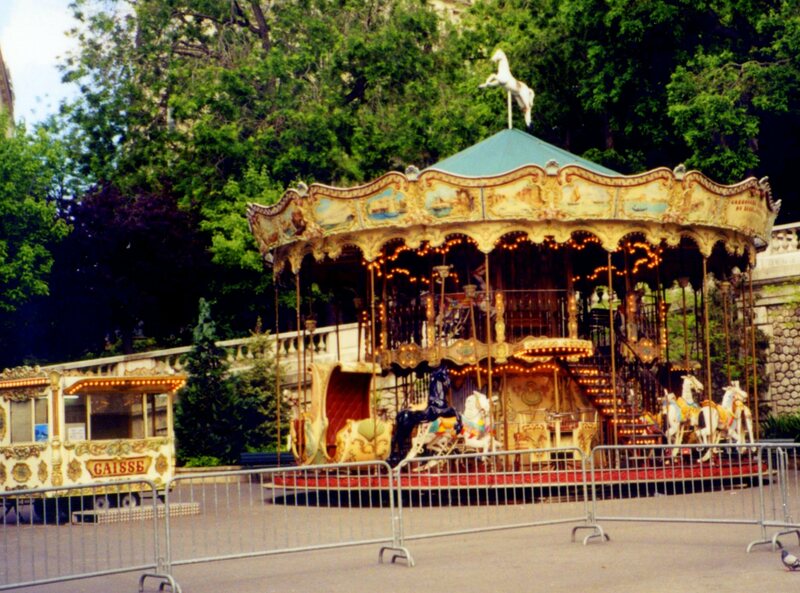 Nearby is the théâtre des marionnettes – the puppet theater- and a vintage carousel. Art, photography and sculptures are displayed in the park’s Orangerie. 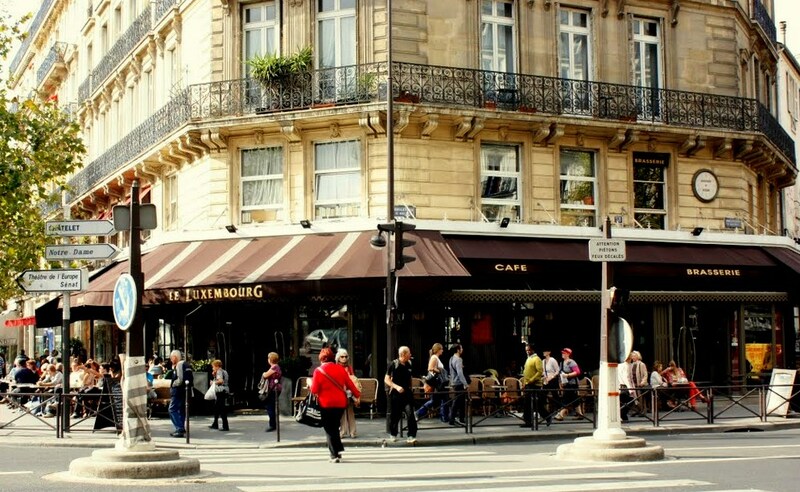 …or instead sit over coffee or an aperitif facing the Boulevard Saint-Michel sidewalk at the Cafe Le Luxembourg, just outside the park. 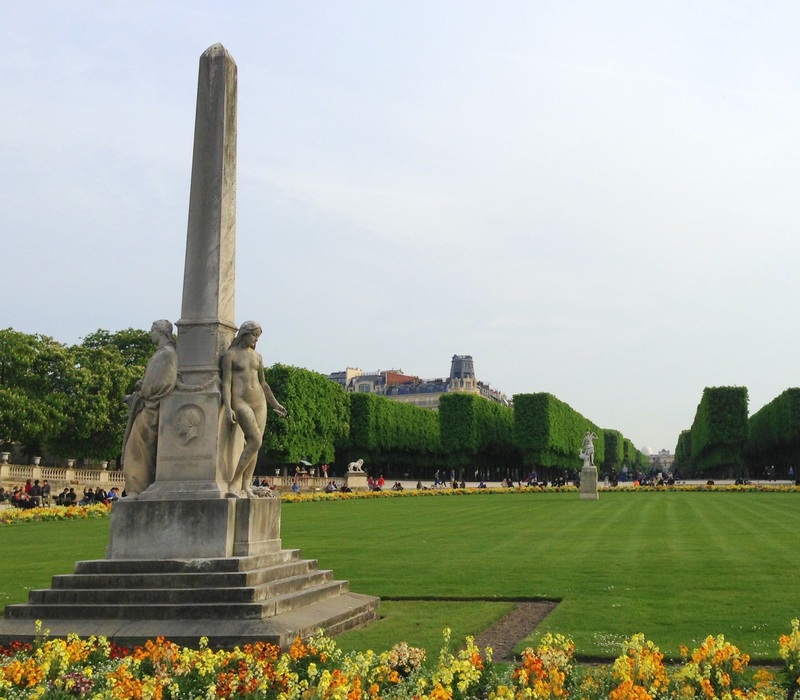 Hours for the Luxembourg Garden vary seasonally. In summer is opens at 7:30AM and closes at 9:45PM, and in winter it opens at 8:15AM, and closes at 4:45PM… dawn to dusk. Next up for 10 Days In Paris are highlights from select museums. 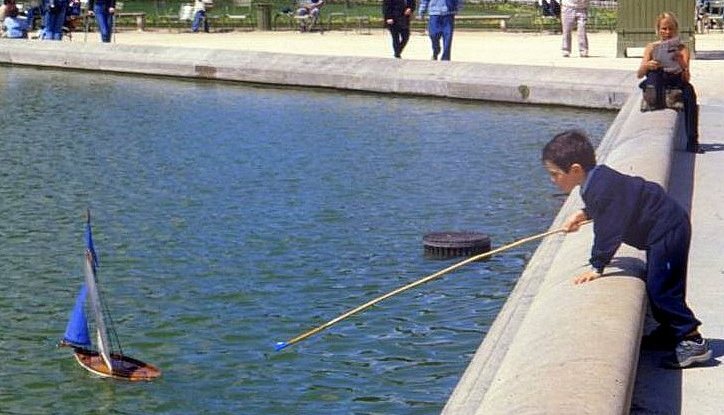 Arabs have been emigrating to France since some returned from Egypt with the remnants of Napoleon’s Grande Armée in 1801, but most first generation émigrés arrived in the ’60’s and ’70’s as an outcome of the Algerian conflict. 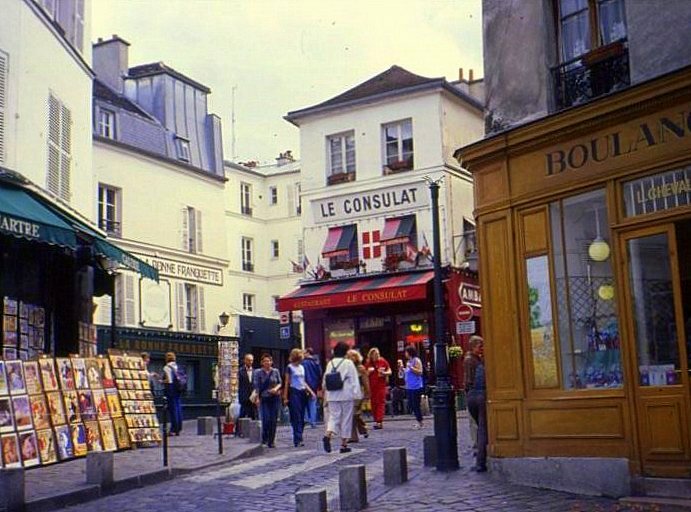 Today, Arabs are now France’s largest non-European immigrant group, and nearly half of the nation’s Arab population lives in and around Paris. 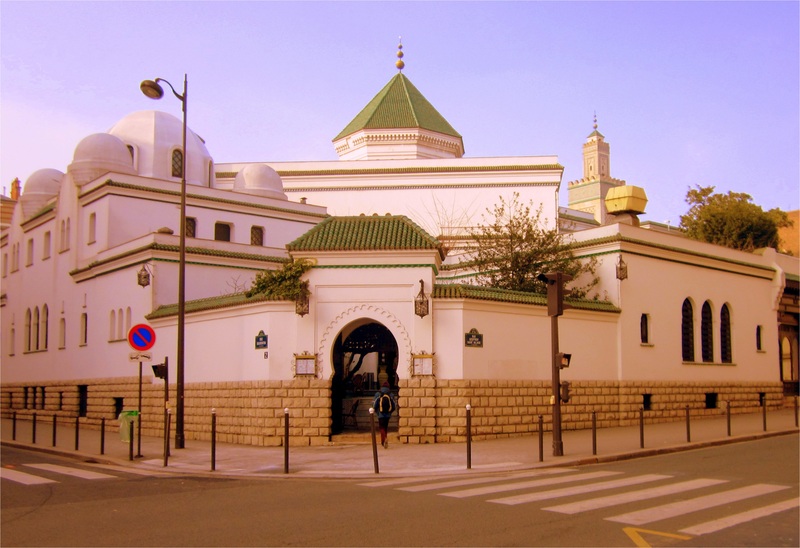 The Grande Mosquée de Paris – the Paris Grand Mosque – was completed and dedicated in 1926 as a token of gratitude to Muslim tirailleurs from French Africa, among whom more than 100,000 died fighting against Germany during World War I. 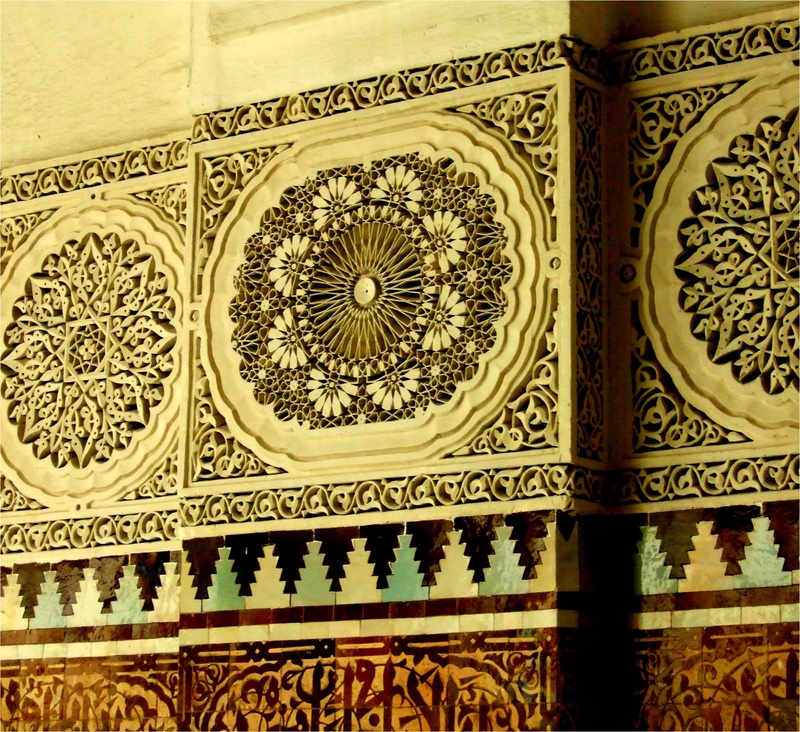 The mosque’s earliest worshippers were Berbers from Algeria, but its construction was first promoted by the king of Morocco, and its design in the mudéjar style mimics that of mosques from Marrakesh to Seville. 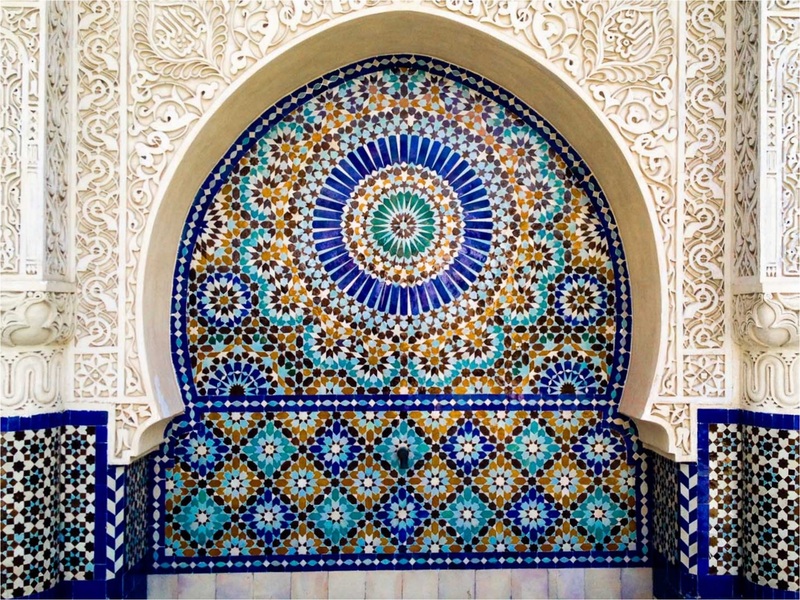 The mosque serves not only as a place where Muslims can come together for salat – prayer – but also as a center for information, education, and conflict mediation. 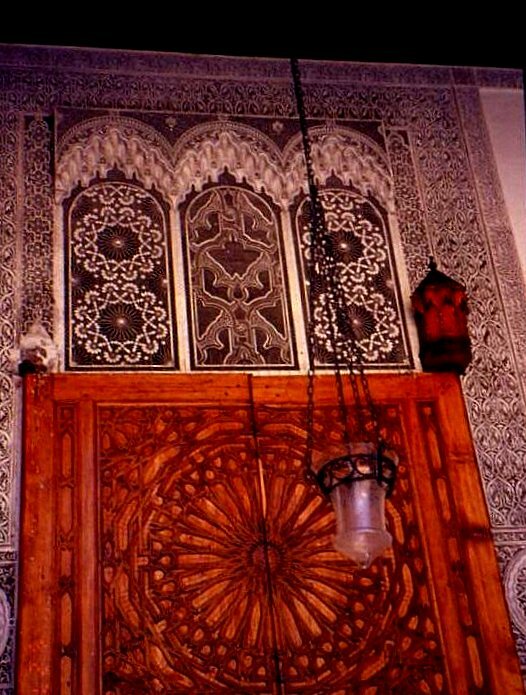 The compound covers more than two acres, and at one end is a courtyard decorated with mosaics, wood carvings and wrought iron brought from Morocco. The minaret towers more than 100 feet above the complex. 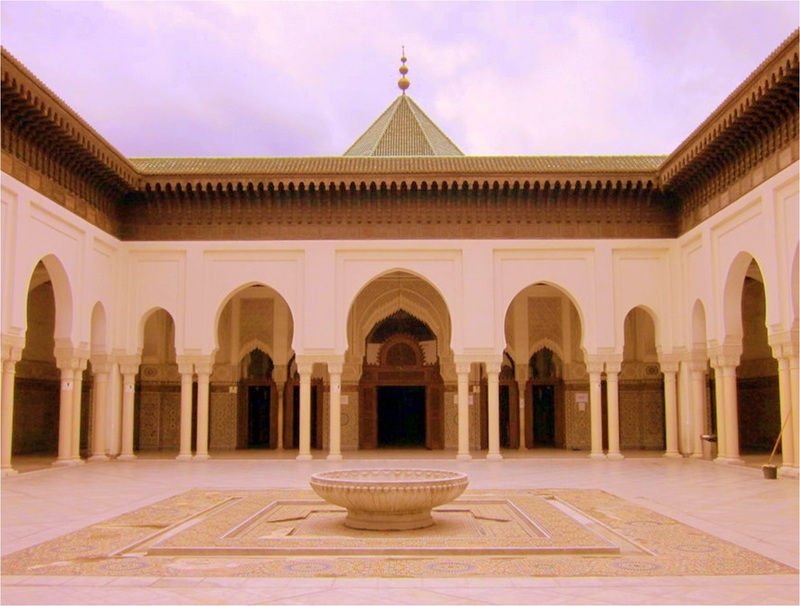 The Mosque has a surprising and little known history. 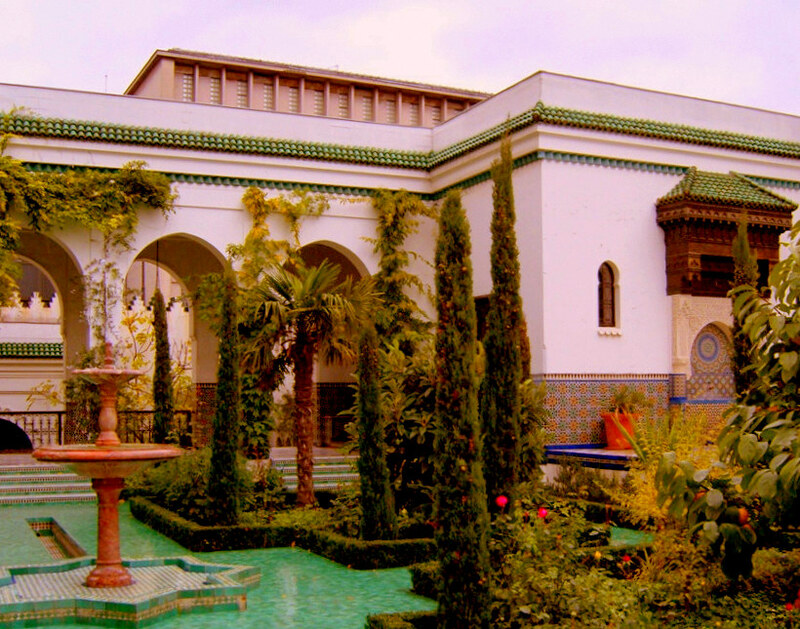 During the German occupation in World War II, the mosque’s imam operated it as a secret refuge and way station for Algerian and European Jews. He provided them with forged Muslim birth certificates and arranged for safe passage, and even had stonecutters carve false gravestone for Jews who had been given new identities. Many Jewish children were given refuge in Muslim clinics outside Paris which also hid downed Allied airmen and paratroopers. The Nazis, unwilling to risk an insurrection among Muslims in North Africa, never challenged the imam. 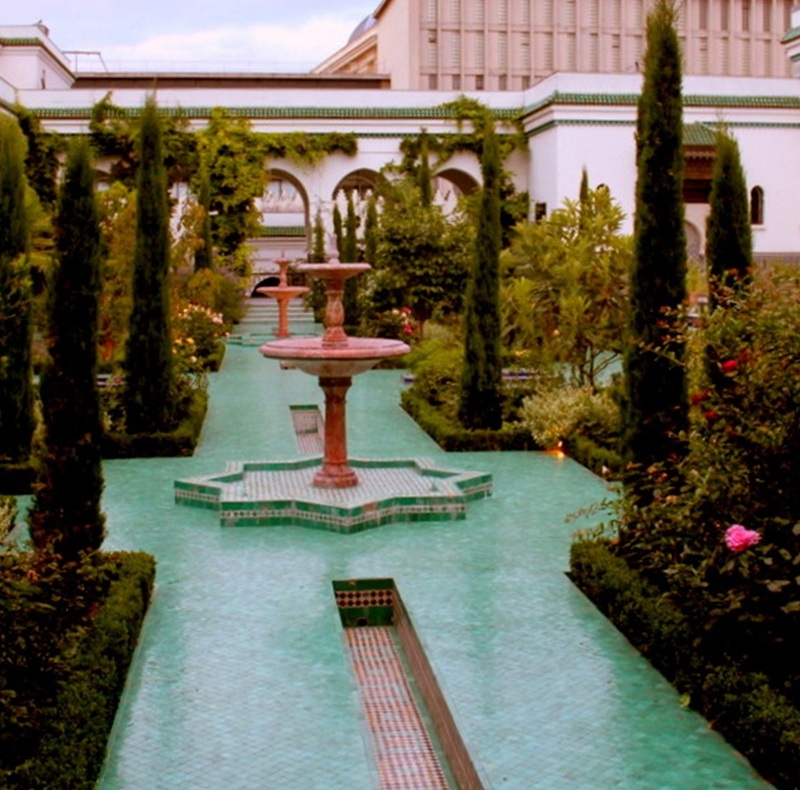 At one end of the Grand Mosque compound are fountains and gardens that recall Granada’s Alhambra. 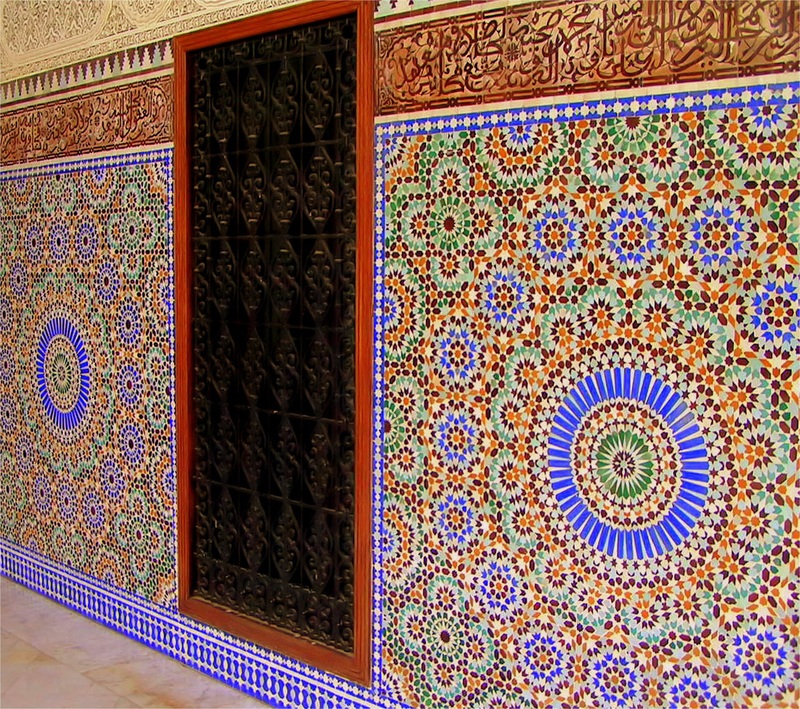 At the opposite end, the walls of a courtyard are covered in intricate Andalusian mosaics, and trimmed in dark eucalyptus and cedar. 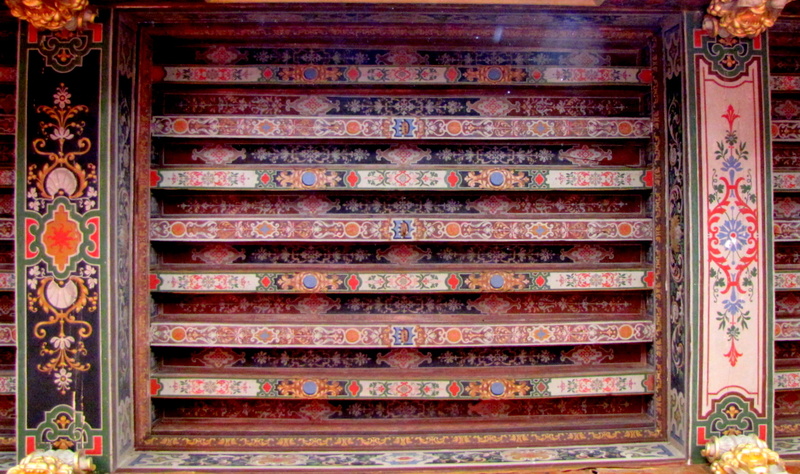 Elaborately carved ceilings and arches soar above walls inscribed with Quranic verses in delicate calligraphy that both supports worship and serves as a decorative element. There are no angelic statues or stained glass saints here; Islam considers such human images to be idolatrous. The entire place is wrapped in striking serenity. Five times daily, the muezzin calls the faithful to prayer from the minaret, and five times daily the imam leads the congregation in prayer. Muslims precede all prayers with a ritual purification, which is why an ablution fountain is provided. 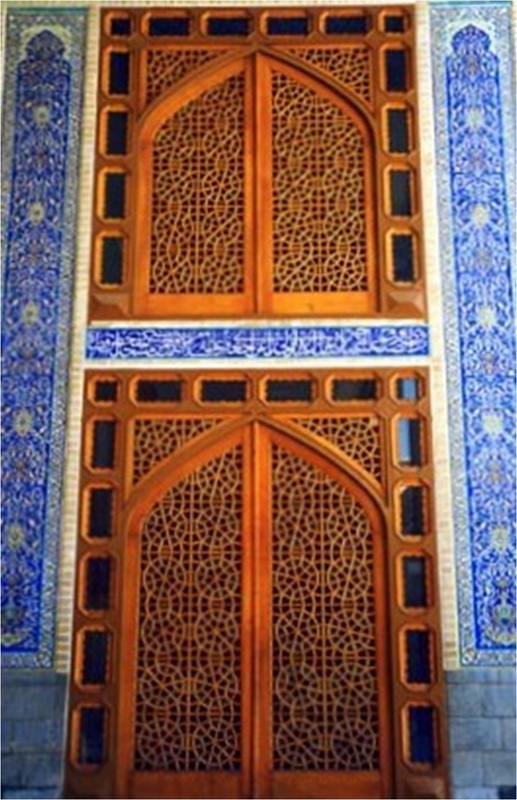 Shoes are disallowed in the musallah – the prayer hall – and racks at the entryways are stacked with shoes. 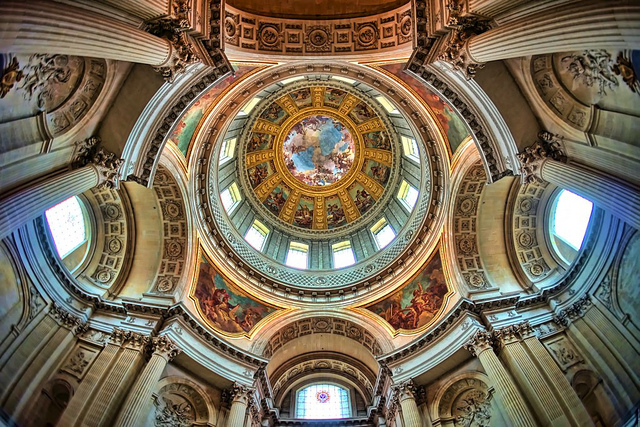 The great dome above the hall signifies the vault of heaven. The hall has no pews or other furniture; worshippers alternately stand and kneel. 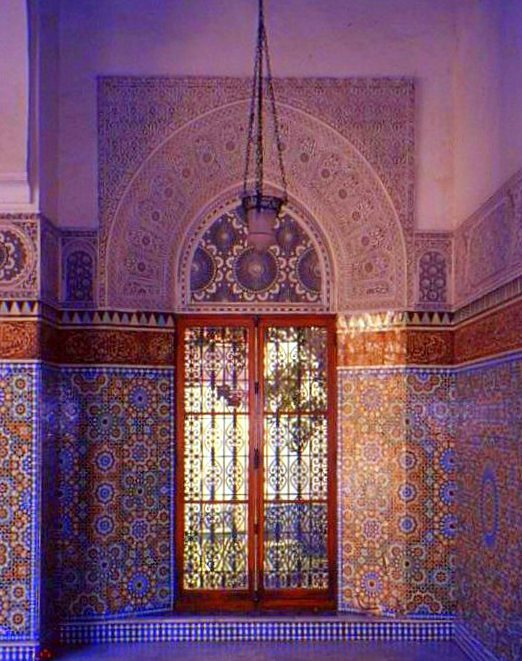 The Paris mosque features a marble Turkish bath that’s open to women two days weekly. In winter it attracts many neighborhood residents. There’s a restaurant in the mosque adjoining the courtyard, where it’s not unusual to see students from nearby universities gather for couscous and sweet mint tea. 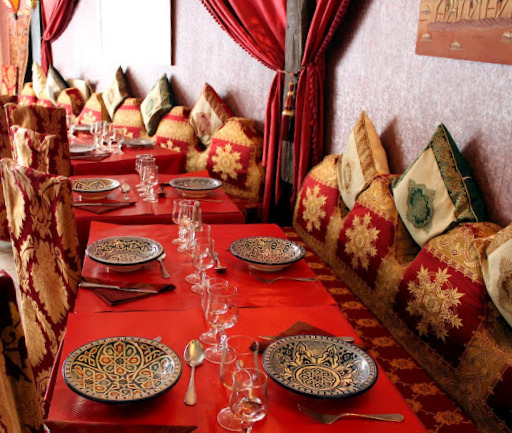 After an afternoon of immersion in the mosque, a meal at a Moroccan restaurant seems like a fitting end to the day, and Restaurant Le Méchoui du Prince – located a block from the Odeon – fits the bill admirably. Visitors are welcome to the mosque and guided tours are available. To reach it, take the Metro to the Place Monge stop and walk about four blocks, or walk less than two kilometers from Notre Dame and take in more of the city along the way. 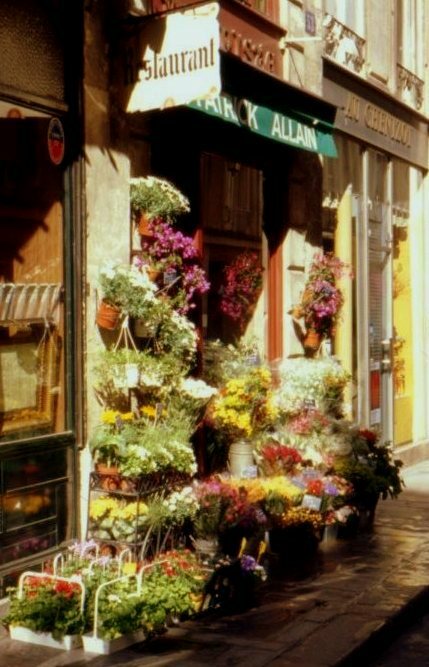 Consider an along-the-way stop at the Pantheon or a visit to the botanical gardens just across the Rue Linne. Covering more than 100 acres, Père Lachaise Cemetery is the largest within the city limits of Paris, and indisputably the city’s most famous. 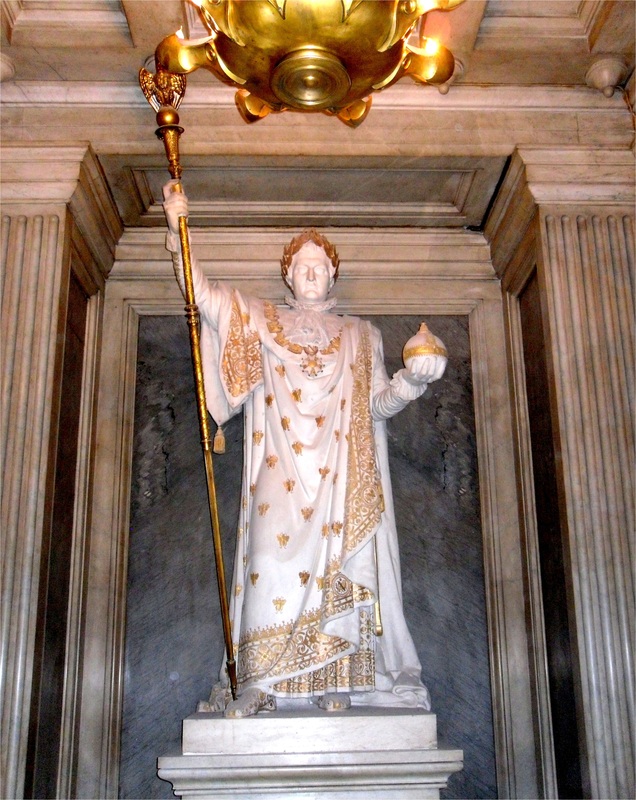 It takes its name from King Louis XIV’s confessor, Père François de la Chaise, who lived in a house on the site. The cemetery was established by Napoleon in 1804 with the declaration that “Every citizen has the right to be buried regardless of race or religion”. Notwithstanding Napoleon’s pronouncement, the cemetery was at first considered too far from the city to attract many burials. 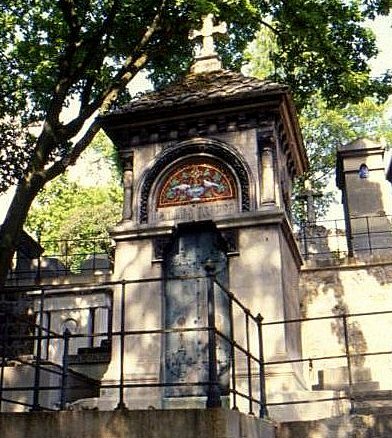 Not until the remains of poet Jean de La Fontaine, Molière, and those of fabled lovers Abélard and Héloïse were transferred to the cemetery did the population begin clamoring for burial among the famous. 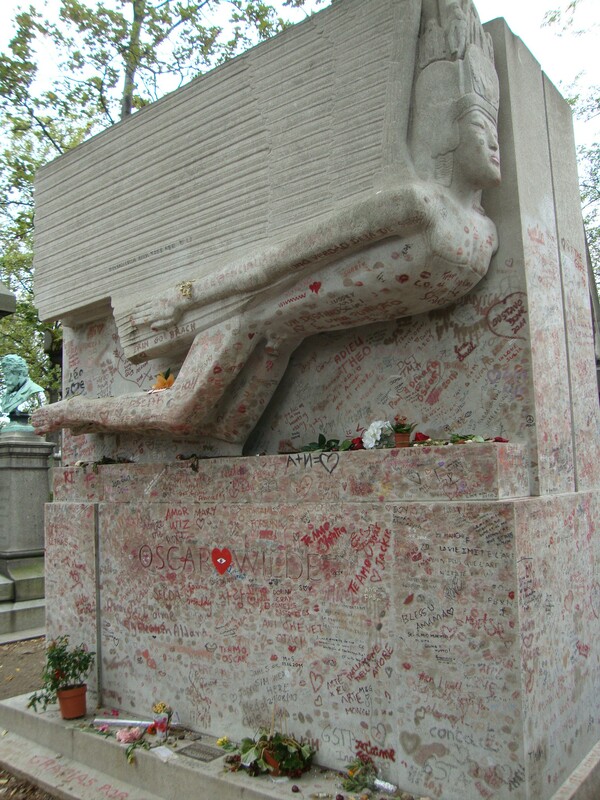 Until Jim Morrison was buried in Père Lachaise in 1971, Oscar Wilde was arguably the cemetery’s reigning pop star. 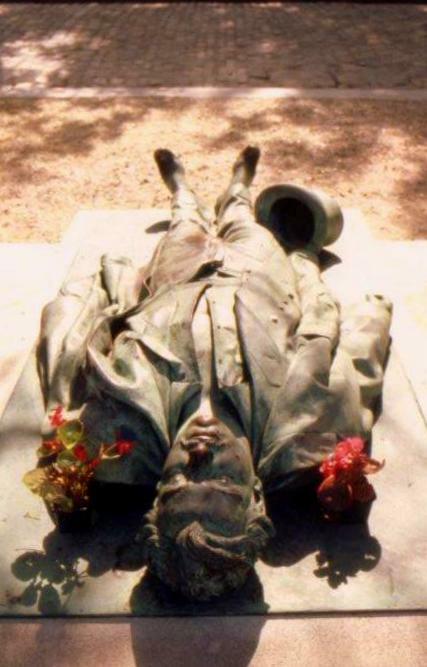 It was once the custom for Wilde’s admirers to kiss the monument while wearing red lipstick, but the damaging effects of the practice have required that the memorial be encased in glass. 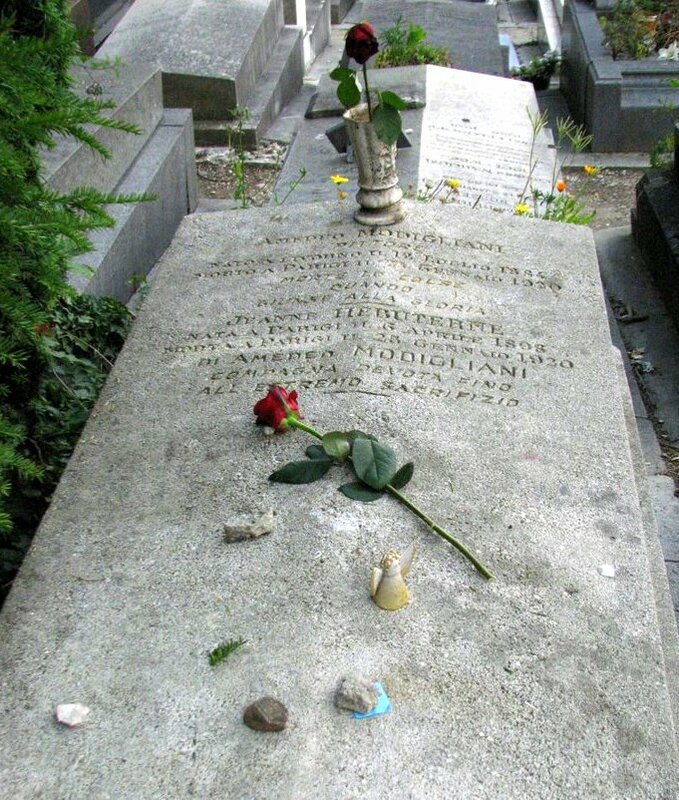 Others musicians buried here include singers Édith Piaf and Maria Callas, composers Bizet, Chopin, and Rossini, and French jazz violinist Stéphane Grappelli. Père Lachaise painters include Eugène Delacroix, Max Ernst, Amedeo Modigliani, Camille Pissarro, and Georges Seurat. 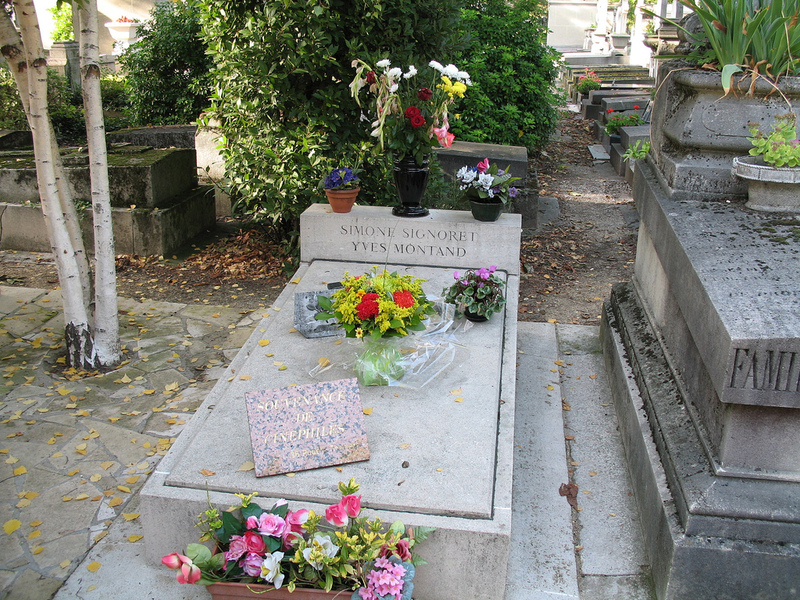 French mime Marcel Marceau‘s grave is here. The Rothchilds also have a family vault here. 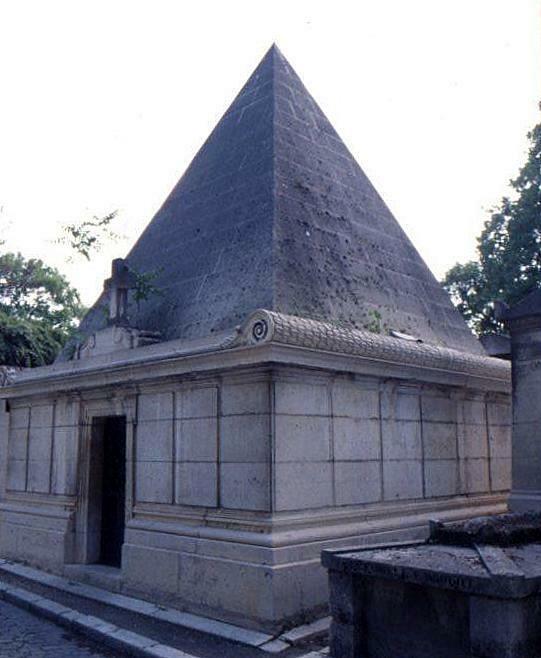 Père Lachaise has been expanded five times. Including the ashes of those cremated and the remains in the ossuary, the number of those who have been interred here is estimated to run as high as 3 million. The cemetery is still accepting new burials from among those who either die in Paris or who have previously lived there, but so few vacant plots remain that today there is a waiting list. Plots are now typically leased for 10 to 30 years, and abandoned remains from unrenewed leases are removed to make space made for new graves. Those exhumed are boxed, tagged and moved to the cemetery’s ossuary. 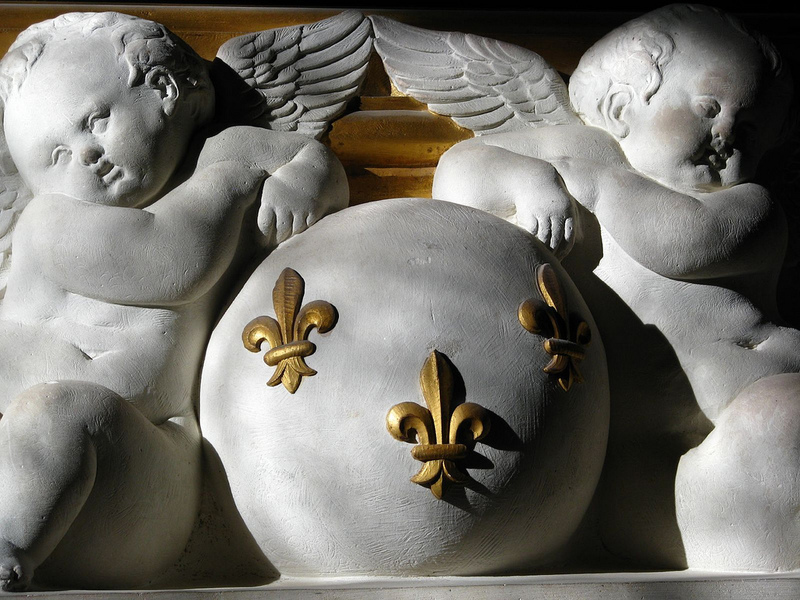 Graveside monuments run from the mundane to the extravagant, and styles range from classic to contemporary. The best among these make of Père Lachaise a giant sculpture museum. 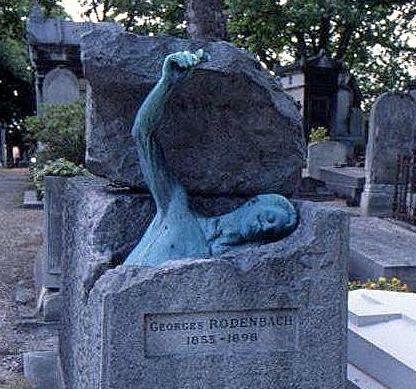 An eerie sculpture on the grave of Belgian poet Georges Rodenbach is positively unnerving. 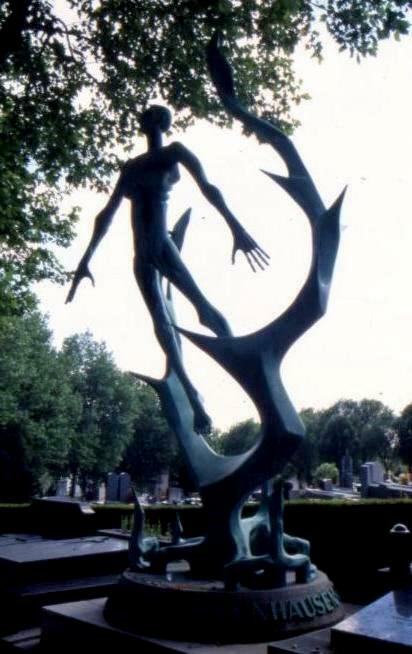 In addition to the gravesites of notable individuals, there are some stirring monuments to victims of genocide and mass murder. 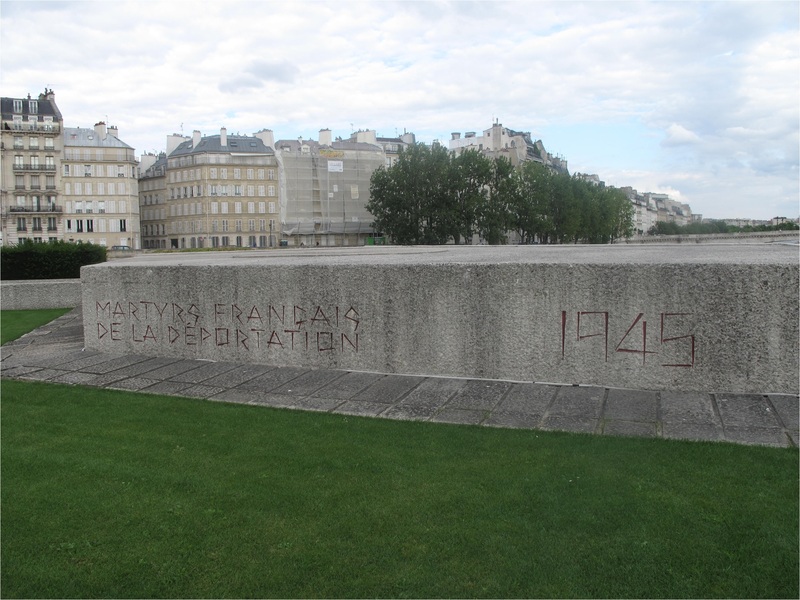 The Communards’ Wall marks the site where the last of the insurgents was executed in 1871 during the “Bloody Week” in which the Paris Commune was crushed. 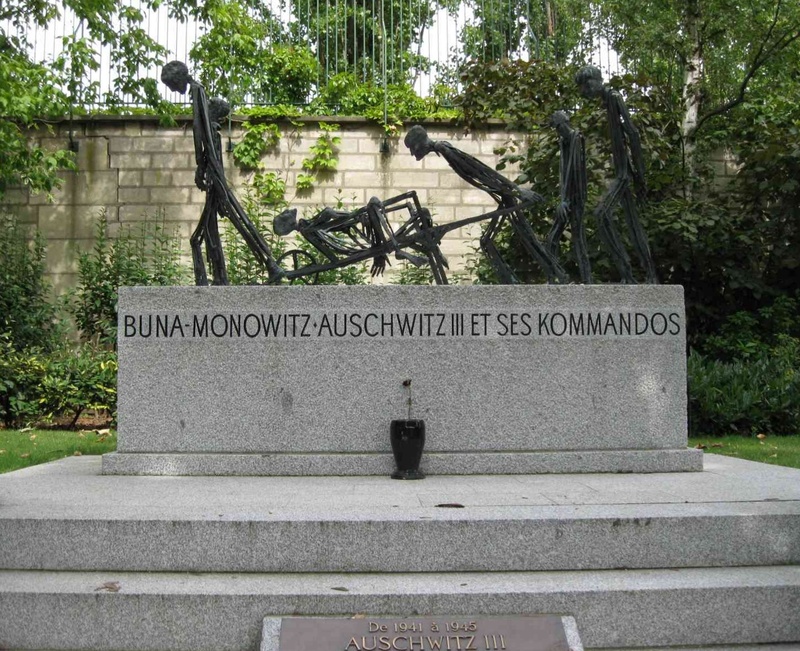 Among the Holocaust memorials here are those dedicated to victims of Auschwitz, Bergen-Belsen, and Dachau. 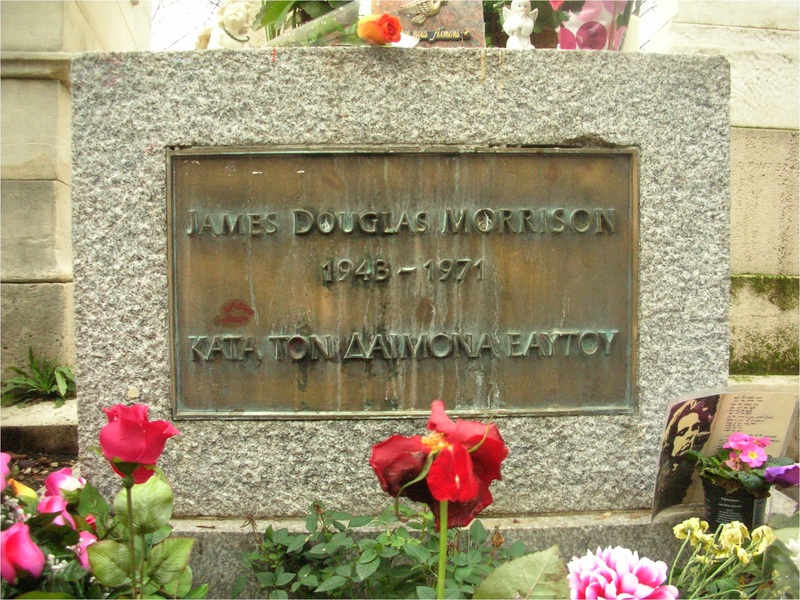 Père Lachaise cemetery is located on Boulevard de Ménilmontant, and served by the Metro: Philippe Auguste on Line 2 is near the main entrance), Père Lachaise, on Lines 2 and 3, is near a side entrance, and Line 3 Gambetta station on line 3, affords entry near the tomb of Oscar Wilde with downhill walk through the rest of the cemetery. Capped by the white dome of the Sacré Cœur Basilica, Montmartre is a hillside neighborhood on Paris’s north side with a rich and bohemian history. 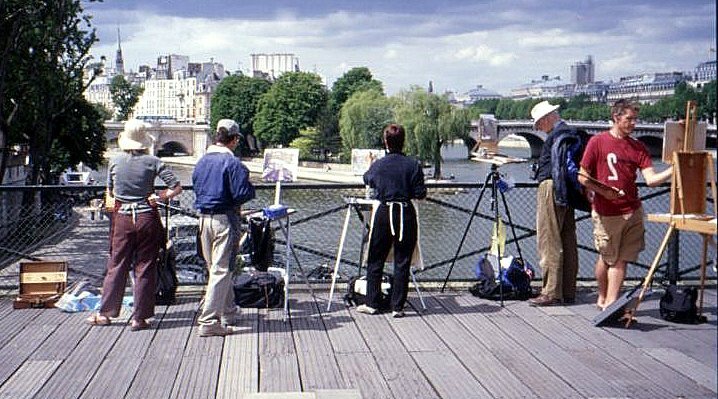 It’s where artists Monet, Mondrian, Pissarro, Matisse, Degas, Toulouse-Lautrec and van Gogh painted during the Belle Époque. It’s where African-American expatriate Langston Hughes wrote, and it’s where the Moulin Rouge birthed the can-can. 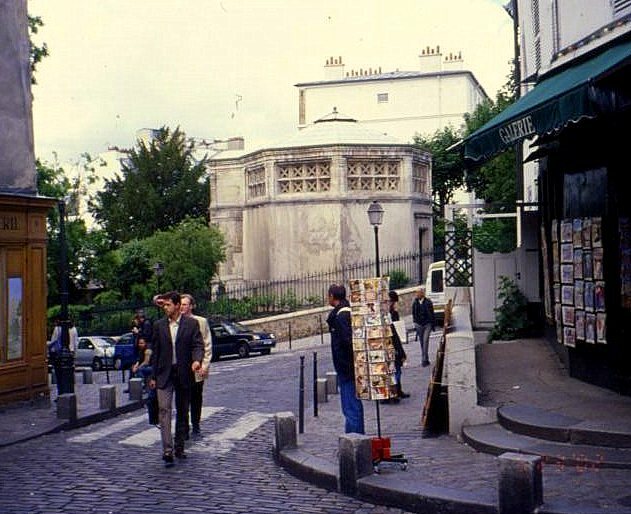 Montmartre first appears in history as the place where Bishop Saint Denis was decapitated by the Romans in 250 A.D. for preaching the Christian faith. Nearby excavations have turned up vestiges of Roman baths from the 2nd century and Roman coins from the 3rd century. 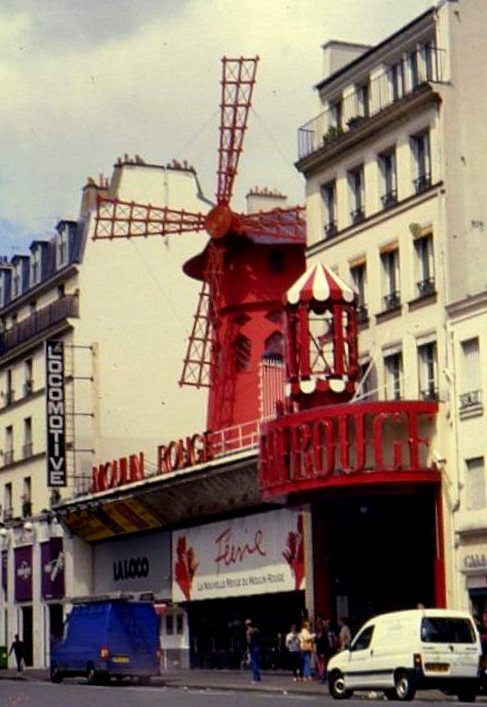 The first of the windmills that later gave the Moulin Rouge its name appeared on the hill in the fifteenth century. A couple of the original thirteen mills still remain. 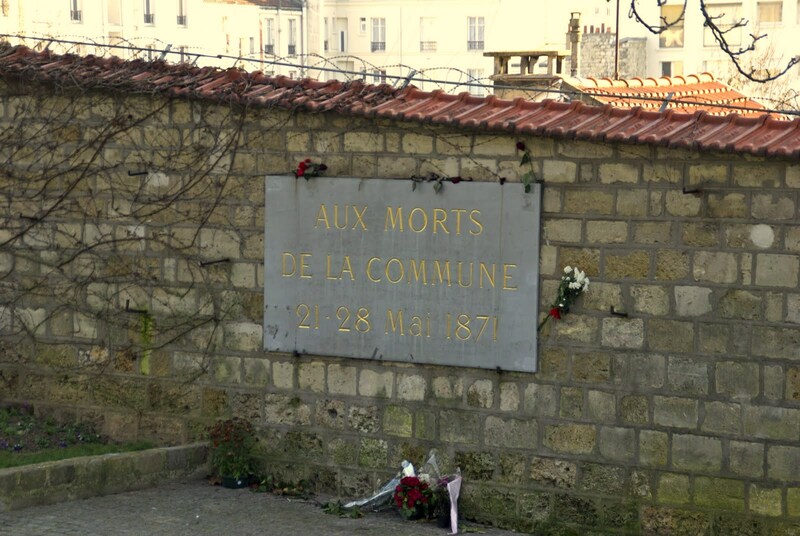 Montmartre is also where the Paris Commune‘s 1871 uprising began. The heights were retaken from the Communards by the French army in heavy fighting that became known as “Bloody Week” and the uprising was soon quelled. The Sacré Cœur Basilica was built as a symbol of penance for the suffering of the Paris Commune uprising and the Franco-Prussian War. Financed by public subscription, construction began in 1875 and lasted for more than forty years. 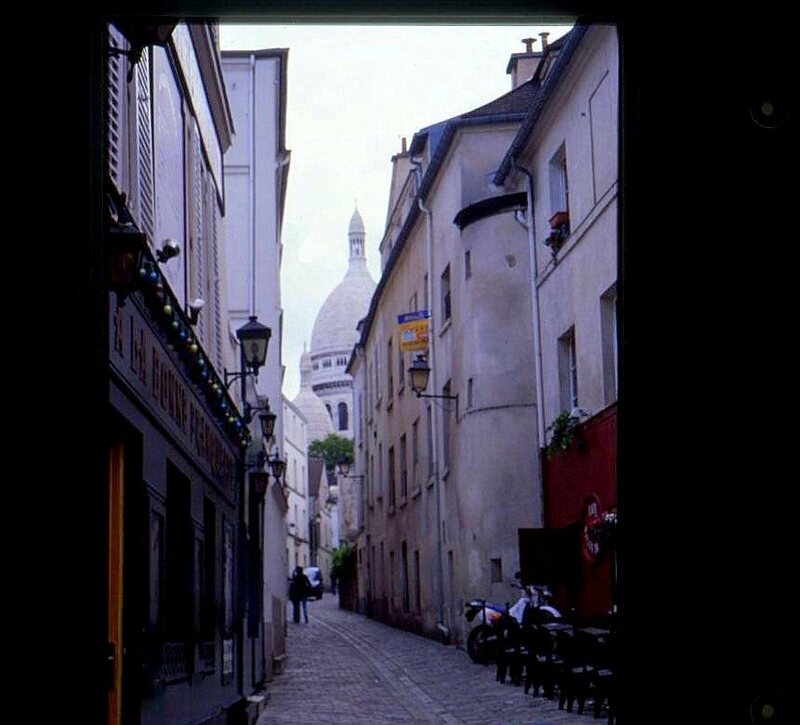 By the turn of the nineteenth century, Montmartre had become an artists’ colony famous for its cabarets and cafes. Cabarets like the Chat Noir and the Lapin Agile were popular haunts for writers and poets, and the Moulin Rouge is the setting for much of Toulouse-Lautrec’s work. Among the last of the bohemian gathering places to shutter its doors was R-26, a salon frequented by Josephine Baker and Django Reinhardt, who immortalized it in his song “R. vingt-six”. 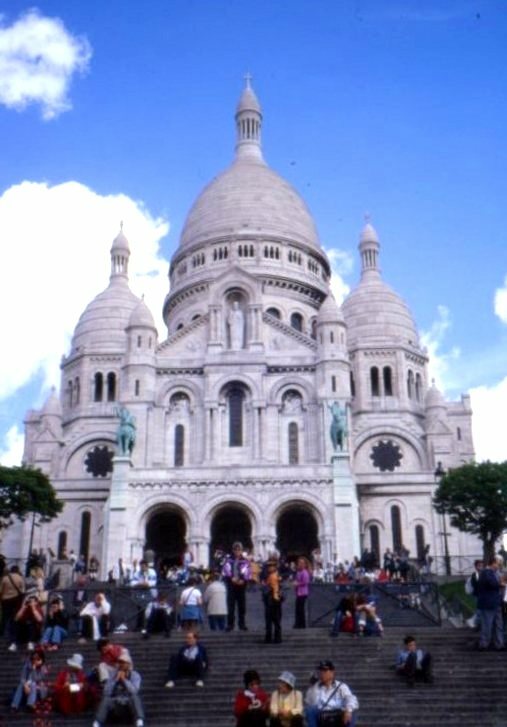 The Basilica Sacré Cœur is a great starting point for a stroll through this picturesque neighborhood that winds down hill toward the Pigalle district. The route passes the Espace Dalí, which showcases the work of Salvador Dalí. 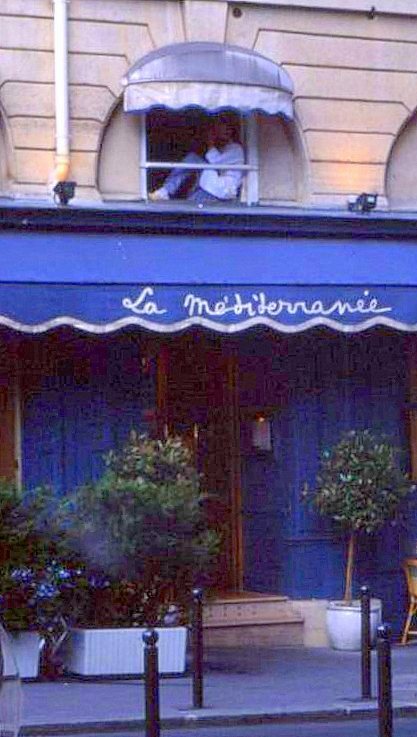 It also passes Renoir’s former studio, now the Musée de Montmartre, and the Bateau-Lavoir building, where Picasso, Modigliani and other artists once lived and worked. 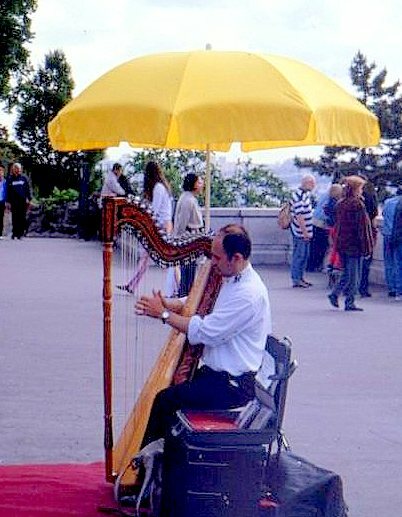 Most of the artists moved to Paris’s Montparnasse neighborhood after the outbreak of World War I, but artists can still be seen with their easels amidst the tables and colorful umbrellas of Montmartre’s Place du Tertre. 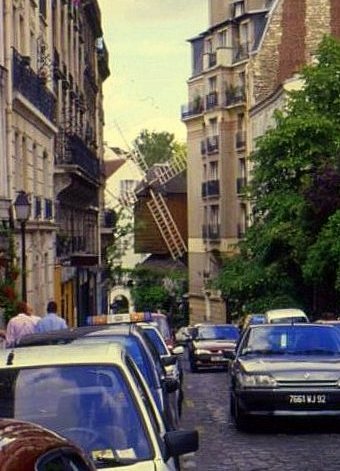 At the bottom of the hill is the red-light district of Pigalle and the Moulin Rouge, from which Toulouse-Lautrec drew much of his inspiration. It’s safe enough during the day, but no place for children, or at night. Today, the neighborhood includes stores that cater to rock musicians, and several rock concert halls, also used for rock music. To get to Montmartre, take the Metro to the Anvers, Pigalle, Blanche, Abbesses, Lamarck – Caulaincourt or Jules Joffrin stations. Take the funicular railway up the south side of the hill or take the bus which circles it. With more well-known landmarks than just about any other city, Paris challenges the visitor to decide which ones will make cut before the return flight. 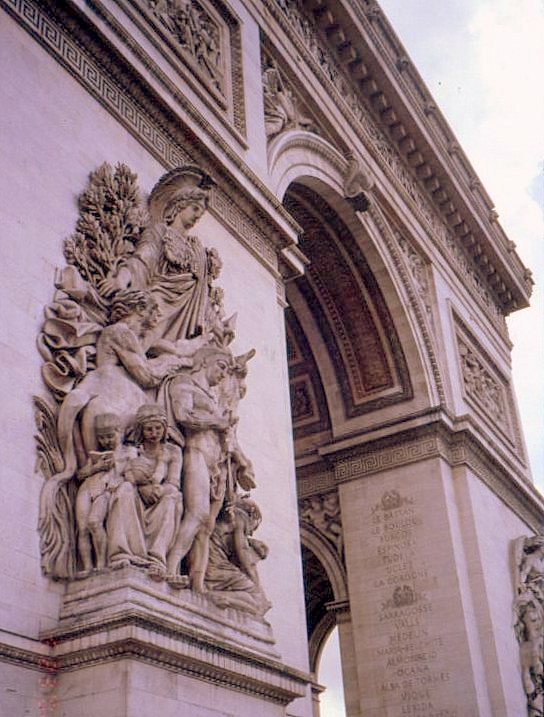 The iconic Arc de Triomphe, midway on the Champs-Élysées, was conceived to honor those who fought for France during the Napoleonic Wars, but also now memorializes those who have since fought for it. 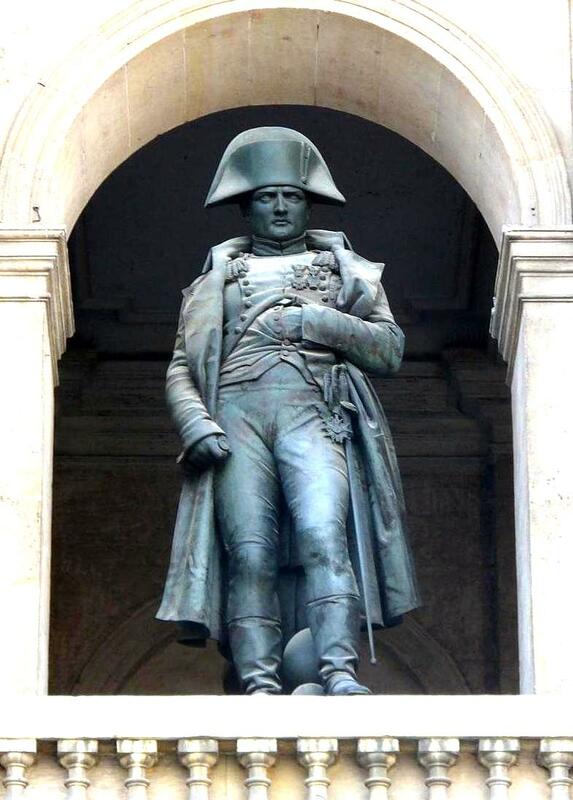 Chiseled into its walls are the names of the hundreds of battles fought by Napoleon’s Grand Armée, and its friezes, figures and bas-reliefs make it something to be seen up close. 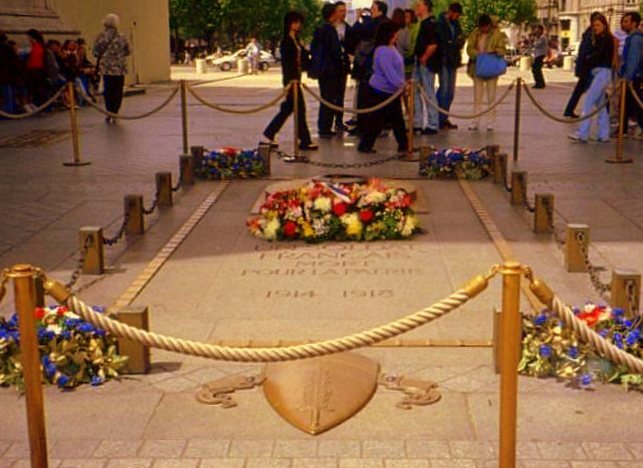 The World War I Tomb of the Unknown Soldier and its Memorial Flame sit directly beneath the arch. In a practice which continued uninterrupted during the German occupation, the flame is rekindled each evening by former combatants,. 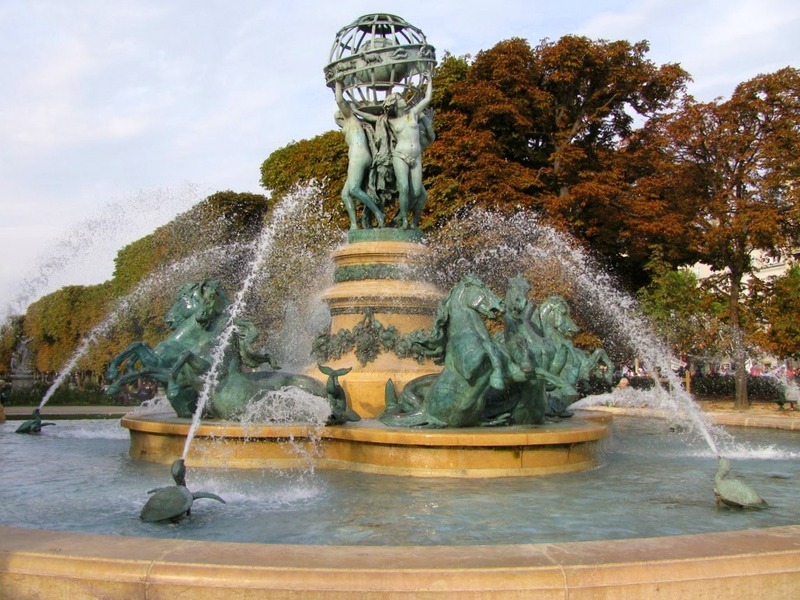 Enjoy a two kilometer walk down the Champs-Elysees to the Place de la Concorde, Paris’s largest square. Today it’s dominated by a giant Egyptian obelisk that once marked the entrance to the Luxor Temple. Decorated with hieroglyphics dating to the reign of pharaoh Ramses II, it was given to the French by the Ottomans. Its gold-leaf cap, added in 1998, replaces one missing since the 6th century BC. It was here that the revolutionary government guillotined King Louis XVI and other notables including Marie Antoinette and Maximilien Robespierre. 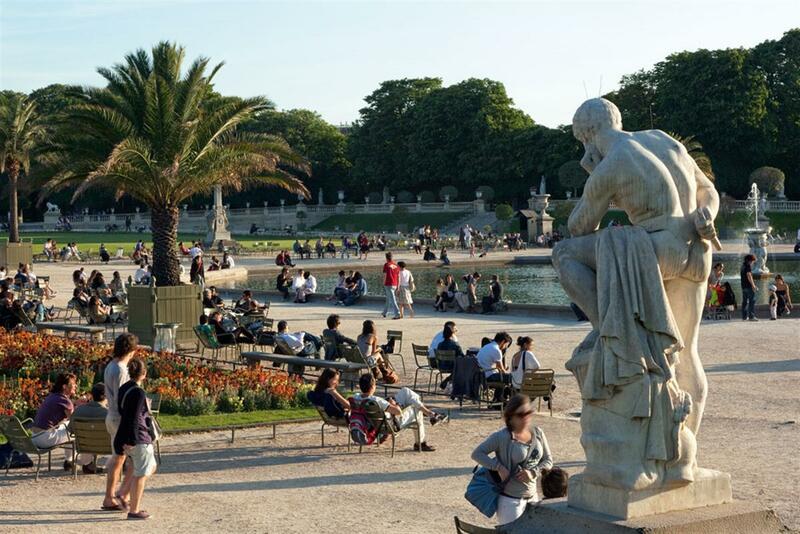 Adjoining it to the east are the Tuileries Gardens and a treasured trio of art museums: the Galerie Nationale du Jeu de Paume, the Orangerie, and the Louvre. Two blocks away down the Rue Royal is the Eglise Sainte-Marie-Madeleine. The distinctive design of this Catholic church is inspired by the Roman temple Maison Carrée at Nîmes. The front facade frames a sculpture of the Last Judgment, and bronze entrance doors bear reliefs representing the Ten Commandments. 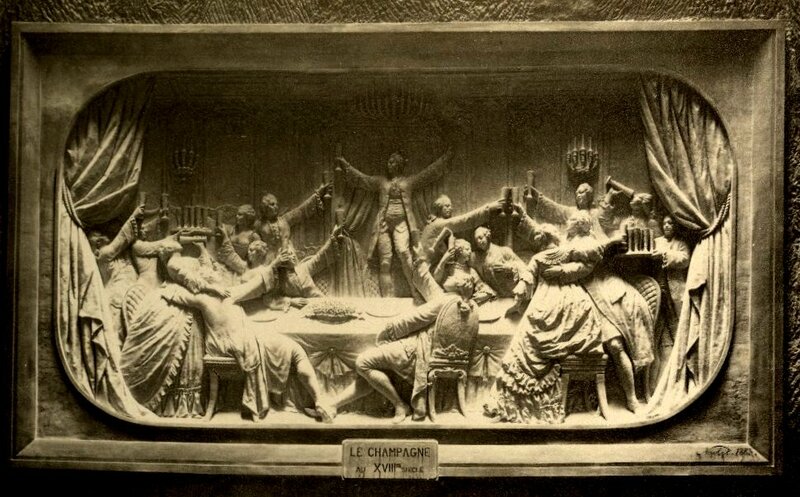 One of its first official functions following its 1842 dedication was the funeral of Frederick Chopin. 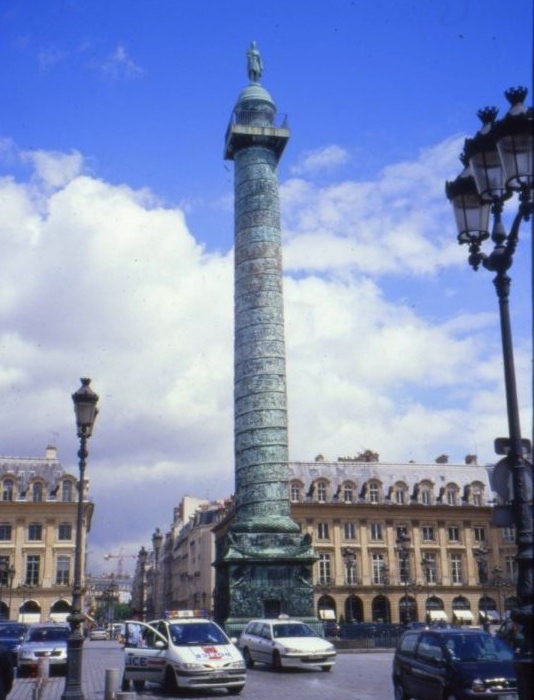 The Place Vendôme is a square located north of the Tuileries Gardens and east of the Église de la Madeleine. 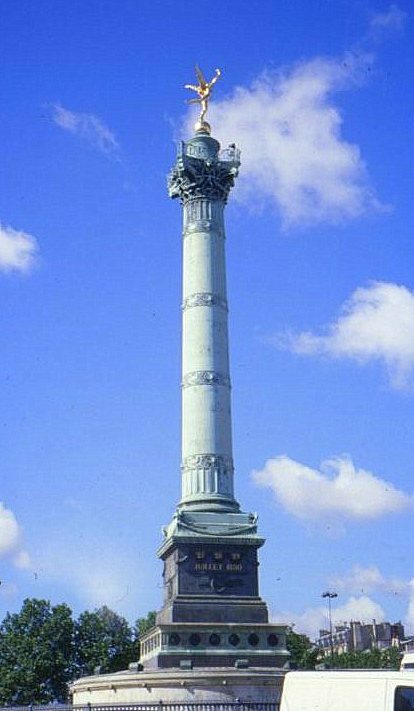 The column at its center was erected by Napoleon to commemorate his victory at Austerlitz. Modeled after Trajan’s Column in Rome, its spiraling bas-relief bronzes were made from captured cannon and depict Napoleon’s campaigns. He stands at its pinnacle, bare-headed and crowned with laurels, a sword in his right hand and a globe with Victory statue in his left. 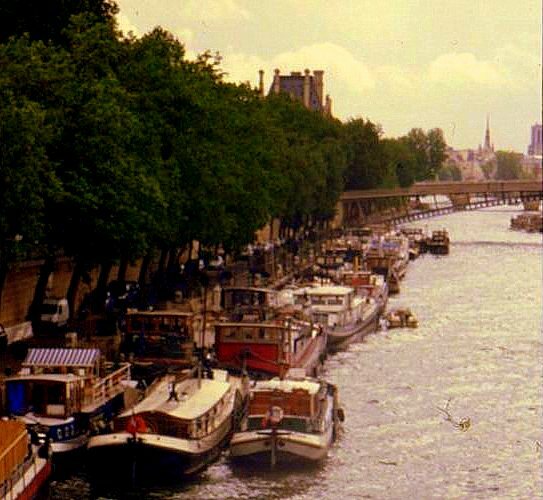 The Cathedral of Notre Dame is most often photographed from its famous front, but I find views of the magnificent flying buttresses which support its remaining walls at least as awe-inspiring compelling, and the view of the river from this point is one of Paris’ most picturesque. 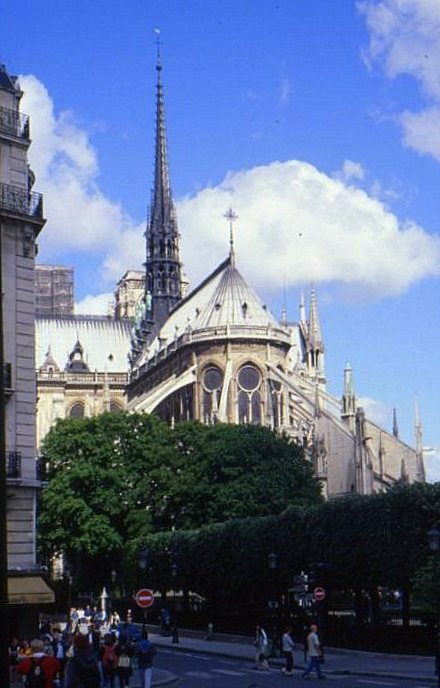 Few of the visitors taking selfies in front of Notre Dame, though, realize that one of Paris’s most unique and moving memorials sits only a stone’s throw away. 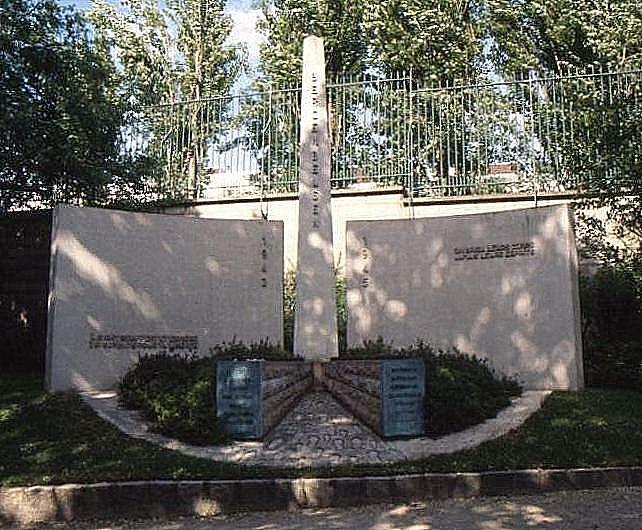 The Mémorial des Martyrs de la Déportation is a memorial to French Jews deported by Vichy France to Nazi concentration camps. Built underground on the site of a former morgue, its long, narrow space and small rooms evoke the claustrophobia of imprisonment. 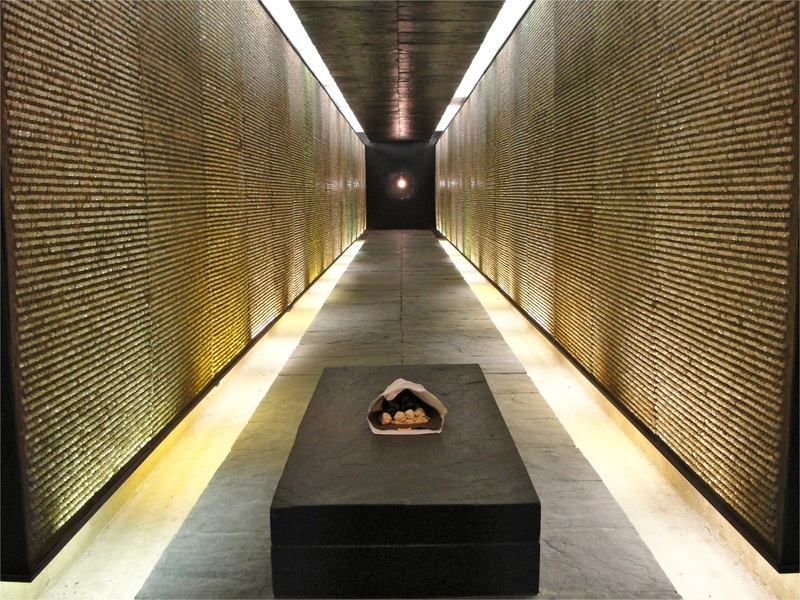 Urns containing ashes from concentration camps are positioned at both ends of the its tunnel. Along the walls of the dimly lit chamber are illuminated glass crystals, one for each of the 200,000 deportees who perished. Inside, an eternal flame burns at the Tomb of the Unknown Deportee. 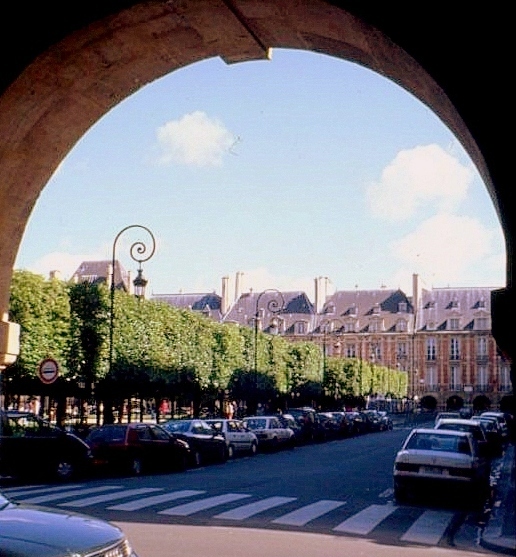 For something lighter in mood, follow the Rue Rivoli (walk or Metro) from the Louvre to the Place des Vosges. 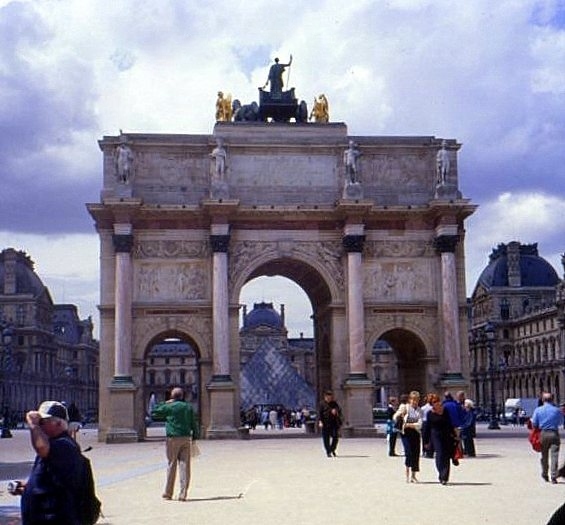 When it was completed by Henri IV in 1612, few realized that this square would become the prototype for the residential squares of other European cities. Homes around it are all built of red brick and stone to the same design. 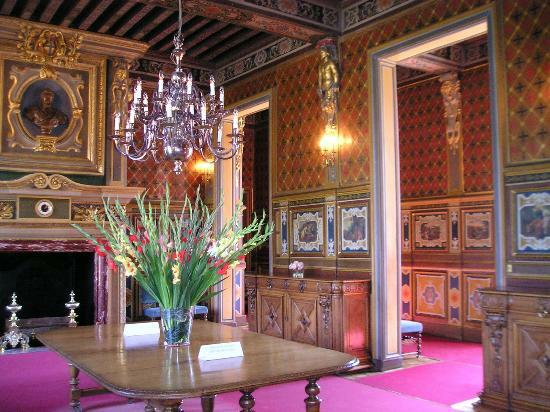 vNotable past residents include Victor Hugo (#6) and Cardinal Richelieu (#21). 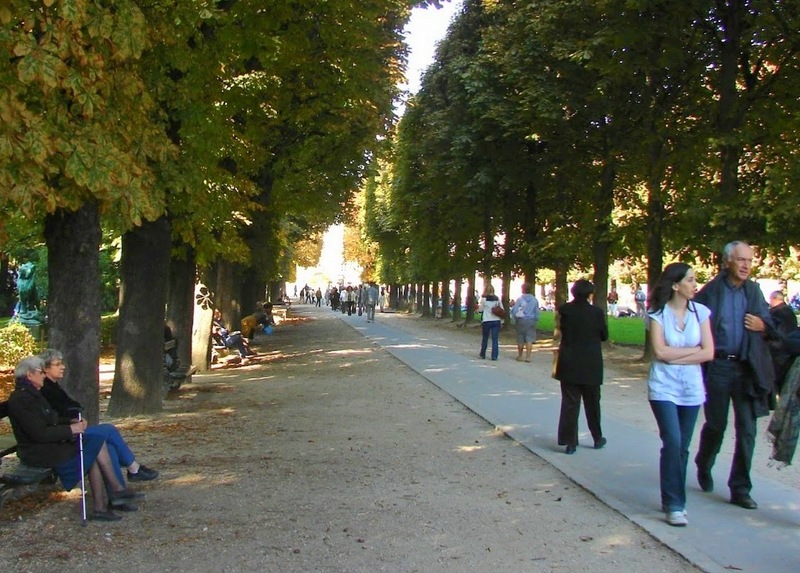 It’s a great place to take a break from tourist site surfing, and to sit in its park under the linden trees. 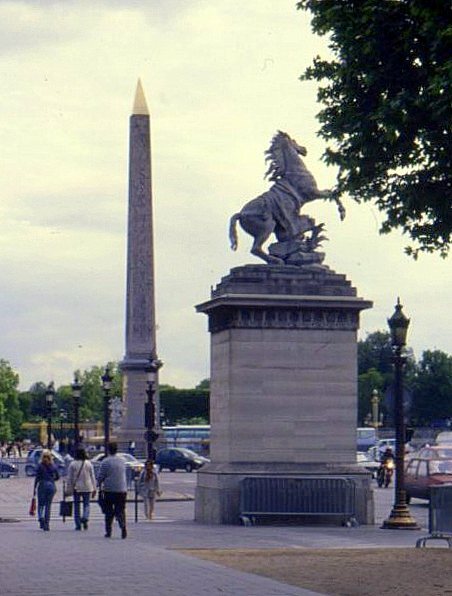 The Place de la Bastille, birthplace of the French Revolution, is a four block walk away. 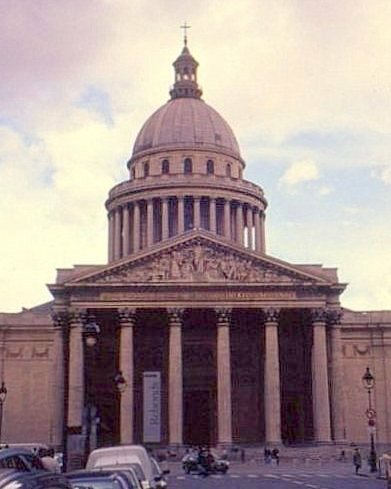 The Bastille itself is long gone, but a monument still marks the spot, and the Paris Opera now often performs at its Opera Bastille theater . Next on this trip: Sorting out Paris’s innumerable museums! My first departure to Paris was scheduled for 9/14/2001, but the trip was delayed by the weeks of air traffic disruption in the wake of 9/11. In the weeks until my postponed departure, it often crossed my mind that U.S. had now shared the experience of Parisians rocked by bombs during Algeria’s war for independence, and Londoners reeling from bombings by Irish terrorists. I arrived in Paris months later to find that the 9/11 disaster still evoked great sympathy for Americans among Parisians. The irony was that only weeks before, U.S. conservative pundits had rebranded French Fries as Freedom Fries to protest lack of French participation in its Iraq invasion. There may be no other city written about, photographed, and blogged about more than Paris, which challenges anyone writing about it to offer a new take. 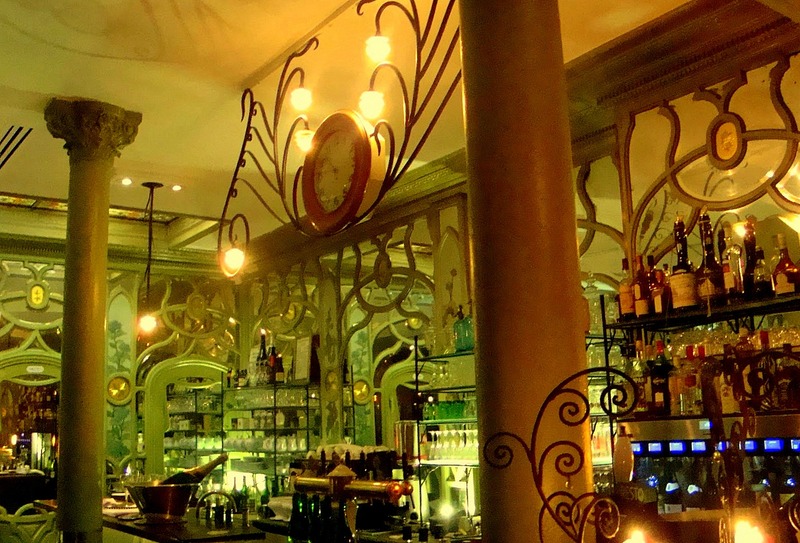 Paris is a city living very much in the present, but imbued always with a sense of its past. Its monuments, museums, and cathedrals are milestones that wordlessly sketch out a millennium of history on its every street. 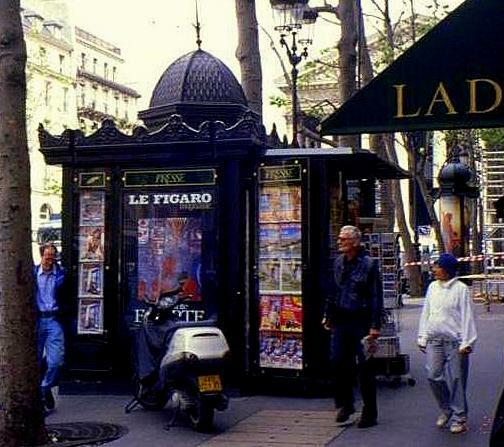 Paris is egalitarian in its appeal. For the better part of two centuries, it has held the affections of old and young, the well-off and not so-well-off, students and artists of all stripes, and foreign tourists and expatriates. Few cities are home to a greater wealth of world class monuments and museums, and the embarrassment of cultural riches creates for the visitor the problem of what to pick from more choices than a lifetime visit could accommodate. But if the measure of a city is the power with which it arouses also the urge to revisit, few other cities continue to attract and engage visitors long after all of the sights have been seen as does Paris, because Paris is a state of mind. 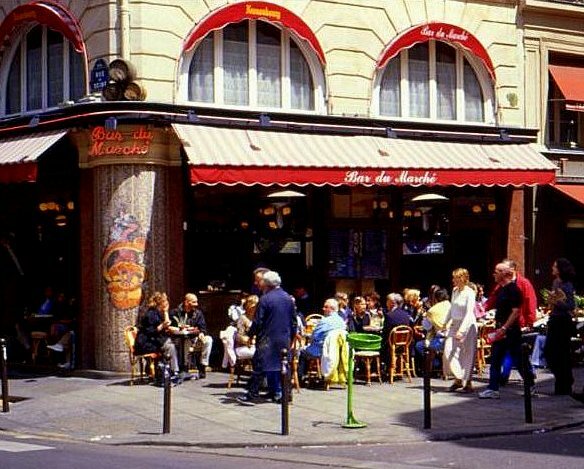 Paris is sidewalk cafes with curb-facing tables. 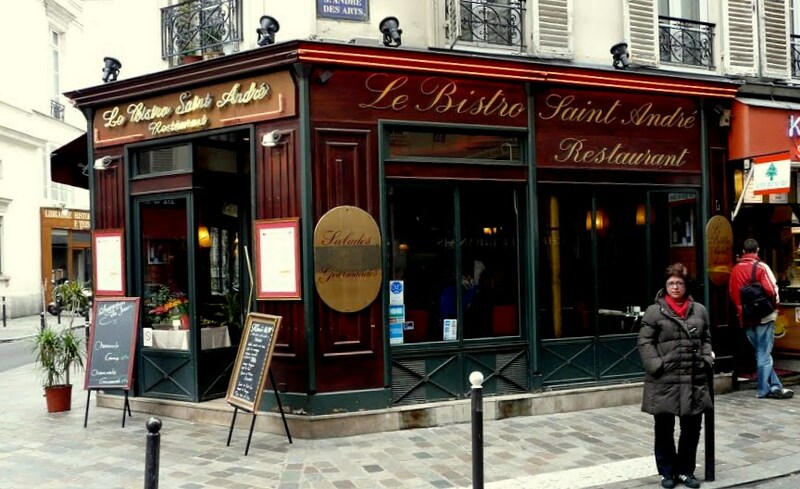 It’s bistros and brasseries. It’s trendy boutiques in historic buildings on broad boulevards. 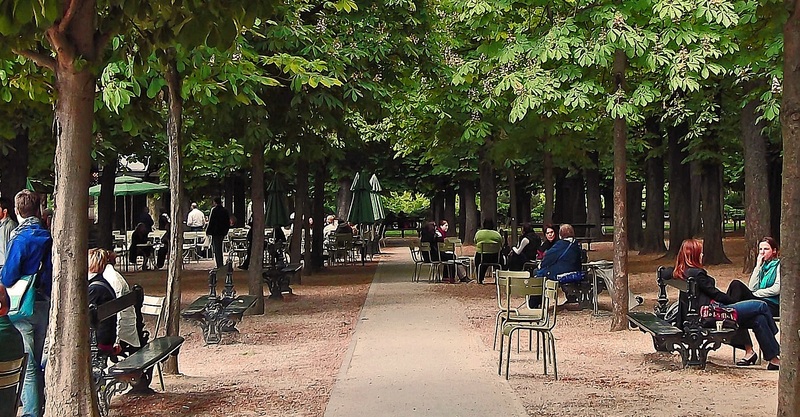 Paris is the tranquil oases of verdant urban parks and intimate side streets. It’s sidewalk newsstands and booksellers and flower vendors. Paris is cafe au lait and pain au chocolat. And the Metro. World-wise and world-weary, defiantly proud and self-assured, and infinitely elegant, Paris is a city that seems to have no doubts about what it is, and what it is not. 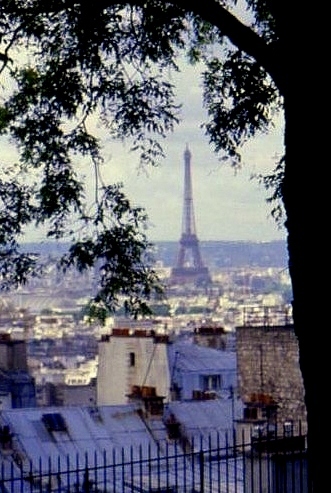 Come along on this visit, and I think that you, too, will fall into the rhythm of the Paris vibe. The itinerary for this trip includes some of my favorite monuments and museums, and the upcoming posts include a few sites that might not otherwise make the cut on your next visit. They’ll include a Sunday afternoon at the Luxembourg Gardens, a morning walk through historically bohemian Montmartre, a day in Reims and the champagne country, a country drive among the castles of the Loire Valley, and a visit to Paris’s stunning Grand Mosque. 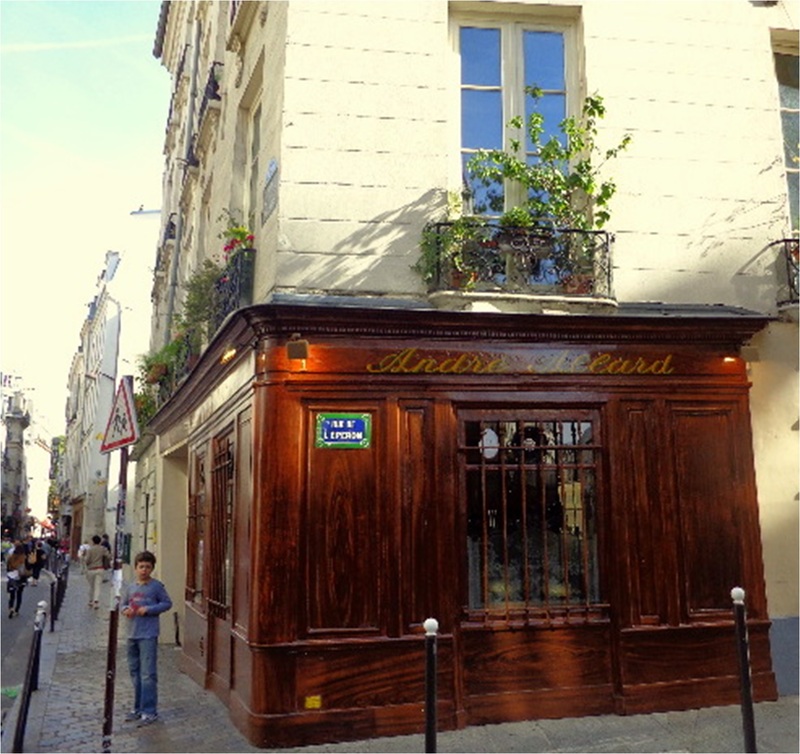 Restaurant Allard, ParisI’ve decided to base in Paris, venturing out on occasional day trips. I’ve decided to forego a hotel room for a walk-up studio with loft bedroom, just a block from the intersection of the Boulevards Saint-Michel and Saint-Germain. It’s within walking distance of many major sights and restaurants, and the nearby Metro and R.E.R. stations put it in easy reach of just about everywhere else. By my third day I’ve become enough a part of the neighborhood that the barista at the kiosk across the street has my “regular” drink working before I even stepped off the curb. Come along on this visit, and I think that you, too, will be caught up in the Paris vibe.